Chapman's Pool is a fascinating cove of grey fossiliferous Kimmeridge shale, with high cliffs capped by Portland rock on either side. Houns-tout on the west side has a high, exposed rocky summit, and as its name suggests, long back in the past this was the look-out of Hund. It was probably of military importance. It has a view as far as Portland and overlooks the valuable coast of Kimmeridge oil-shale workings, a major industrial area from Iron Age and Roman times onwards to the Victorian phase of mining. Now it is a place of geologists, walkers and fishermen. It has a history of shipwrecks. 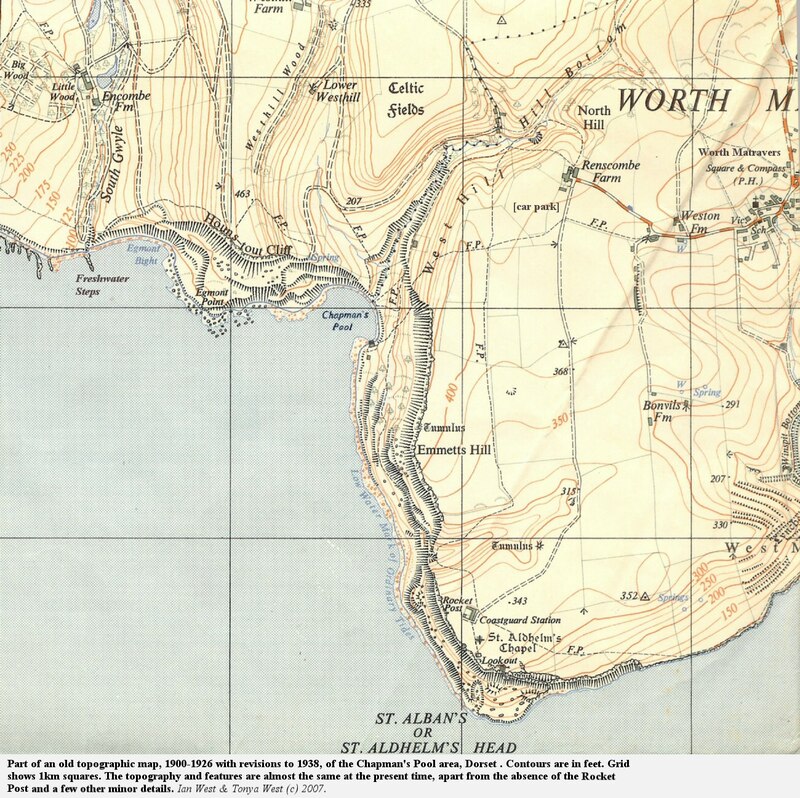 It is easily reached from Worth Matravers on the limestone uplands of the Isle of Purbeck. Many people will walk there in summer. It is a beautiful coast in fine sunny weather. 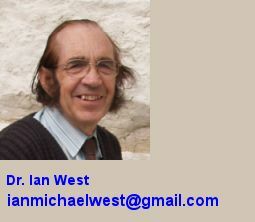 The area is very attractive to the geologist but it is also superb walking country for the south of England. On the windy, limestone, hill-tops, with their dry-stone walls, it can feel like some part of the limestone hills of Yorkshire. There is a good circular walk from Kingston, for example, which includes Chapmans Pool. 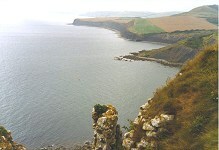 The beach of Chapman's Pool can be reached in good weather and dry conditions. In stormy weather, in winter, it can be completely deserted and has the dramatic quality of a remote coast. It is a very wet, slippery and inaccessibly place, with hazardous cliffs and shore and a feel of danger. The bottom of the main valleys, is characterised by the steep-sided ravine with a stream descending to the beach. This dell is known as Seven Wells Hollow (Bruce, 1989) . The stream has been referred to as "The Lake" ("Lake" is a common stream names in this region). The small steep-sided stream ravine is cut into a broader valley and this is a case of rejuvenation as a result of rapid cliff erosion and retreat of the coast up the stream valley (Arkell, 1947) . It is interesting to compare this to the hanging valley of Pier Bottom, a short distance to the southeast (perhaps you would like to consider why Pier Bottom has not cut down to sea-level?). Pier Bottom incidently takes its name from a former pier once used for loading limestone quarried from St. Aldhelm's Head. Bruce (1989) mentions that some odd blocks of dressed stone still remain on the beach. 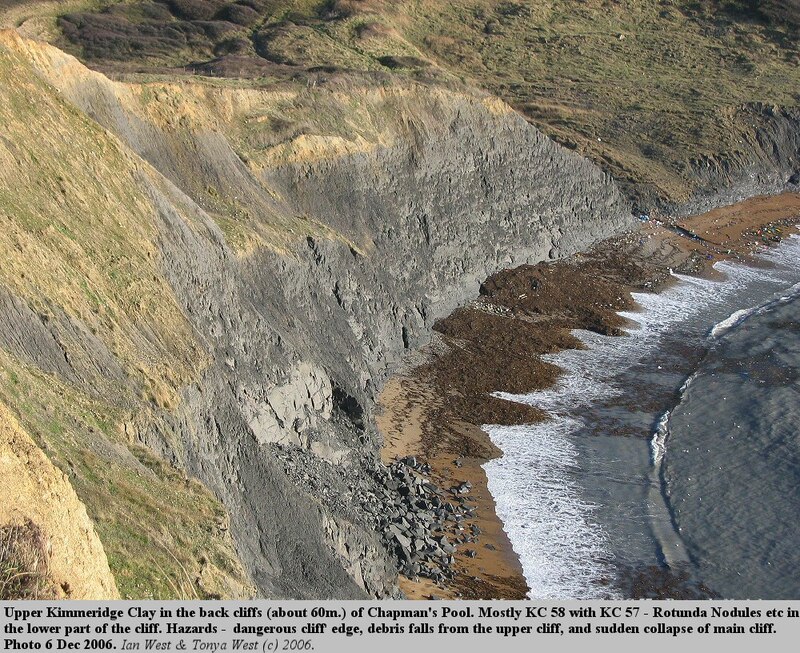 On reaching the shore, the grey cliffs of crumbling shale are immediately attractive to the geologist, but hazardous. At low tide there are shore ledges of shale with fossils visible. Crushed ammonites are abundant in these Upper Kimmeridge Clay shales. 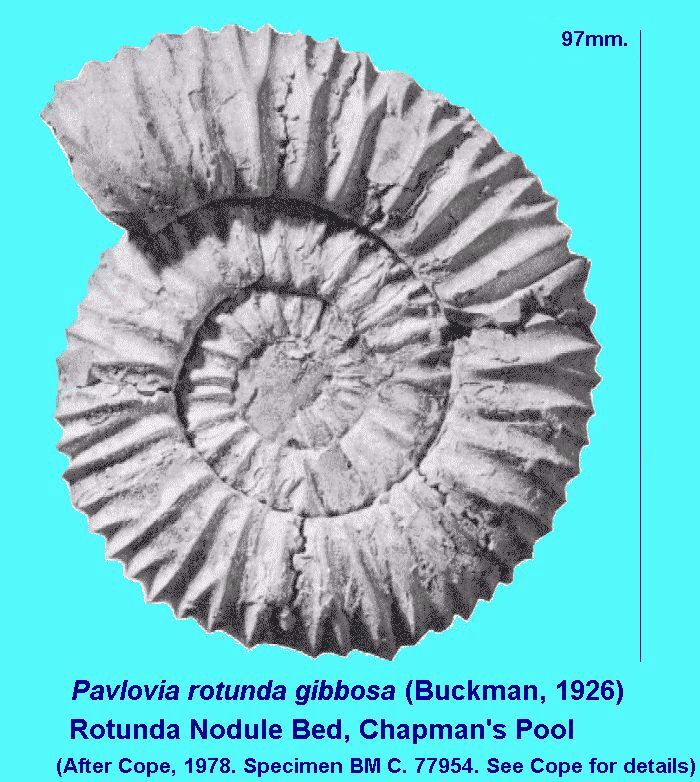 In the cliff, white uncrushed body chambers of perisphinctid ammonites, Pavlovia, are well-known features of Chapman's Pool. Thorough searching around here can lead to much more; there are some unusual brachiopods here and vertebrate remains occur in the area. Chapman's Pool and Houns-tout or Hounstout Cliff are important in showing the succession of the uppermost Kimmeridge Clay and the transitional sequence up through the Portland Sand. 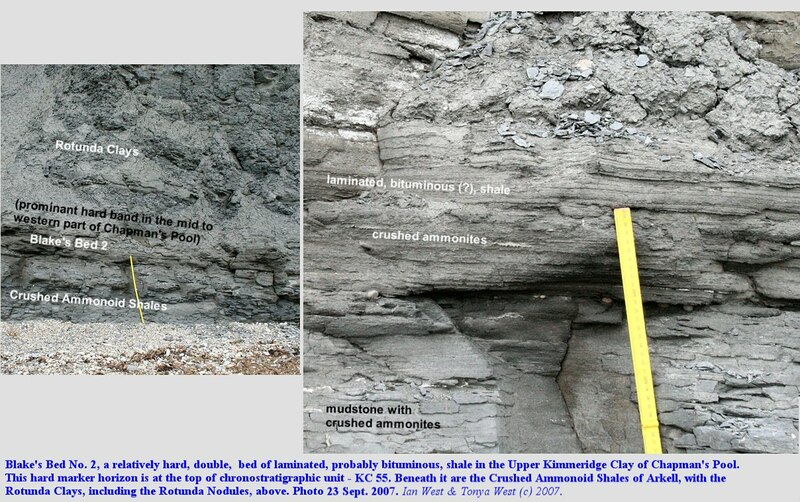 The Upper Kimmeridge Clay is not Kimmeridgian (the Lower Kimmeridge Clay is Kimmeridgian) but is equivalent Upper Tithonian in Tethyan terms and Middle Volgian in Russian Boreal terms. The high Kimmeridge Clay can be seen in the cliffs at Chapman's Pool in the lower part of Houns-tout Cliff. 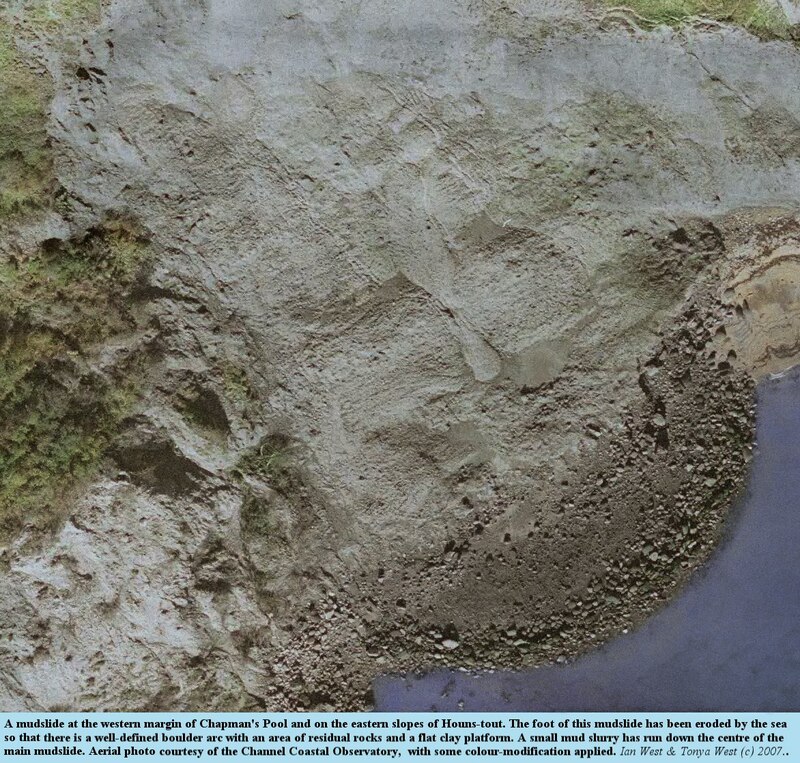 The Portland Sand is in the upper part of Houns-tout and in Emmett's Hill on the east side of the Pool. Houns-tout cliff is notable for providing a good section of the top Kimmeridge Clay and the lower part of the Portland strata. The transition is clearly seen and results from shallowing of the Jurassic sea. It is an impressive place but care must be taken in all this area, though, with regard to falling rocks, soft mud and landslides. These cliffs are certainly interesting for study of landslides and mudslides. Emmett's Hill, on the east side, can be compared to some of the cliffs of Portand (to which it was once joined). The fallen blocks of Portland limestone and dolomite are fossiliferous and the dolomites contain unusual black calcite crystals. On Houns-tout Cliff there was once a carriage drive from Encombe, the stately home, to the west of the cliff round to Chapman's Pool. This was Lord Eldon's carriage drive. It has now been broken away by a landslides but the eastern end of it can be seen as a small cutting and a track heading for the existing road. 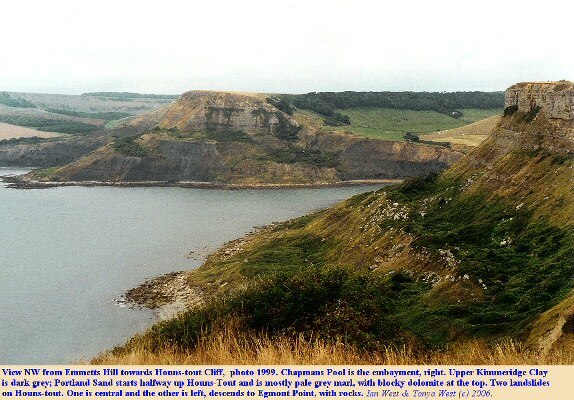 Chapman's Pool, Hounstout Cliff and Emmett's Hill consitute a very important location with diverse geological features in terms of palaeontology, stratigraphy, sedimentology and geomorphology. 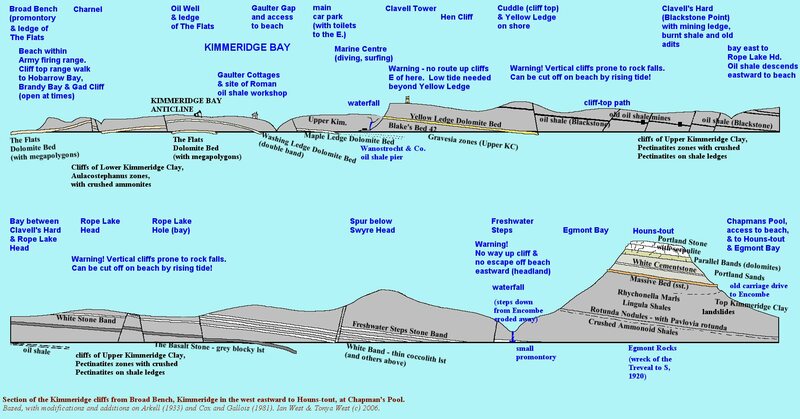 Note that there is some significant danger with regard to the Kimmeridge cliffs. One danger, the main one, is risk of rock fall; the second hazard is that of being cut off by the tide. This applies particularly to the cliffs east of Kimmeridge, although it could also happen at Brandy Bay and elsewhere. In general, keep out as far from the cliffs as possible. 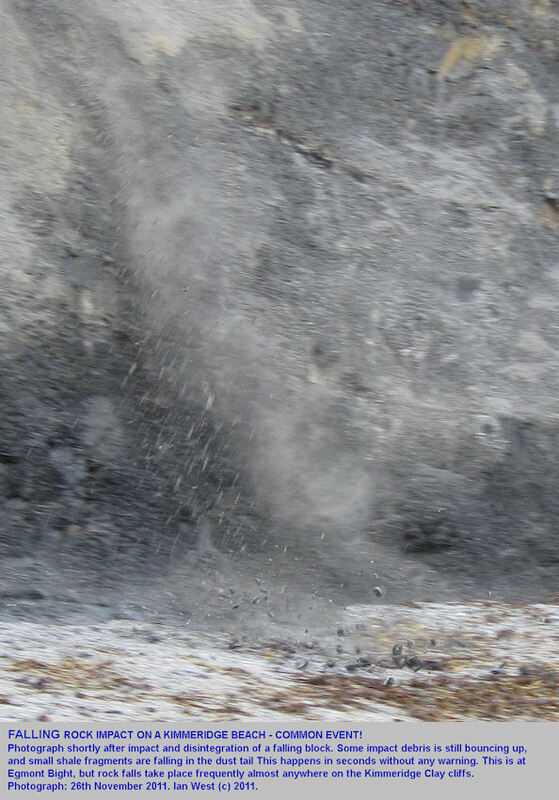 Some debris falls every day and if you are close to the cliff you are at risk of being hit by a rock-fall. 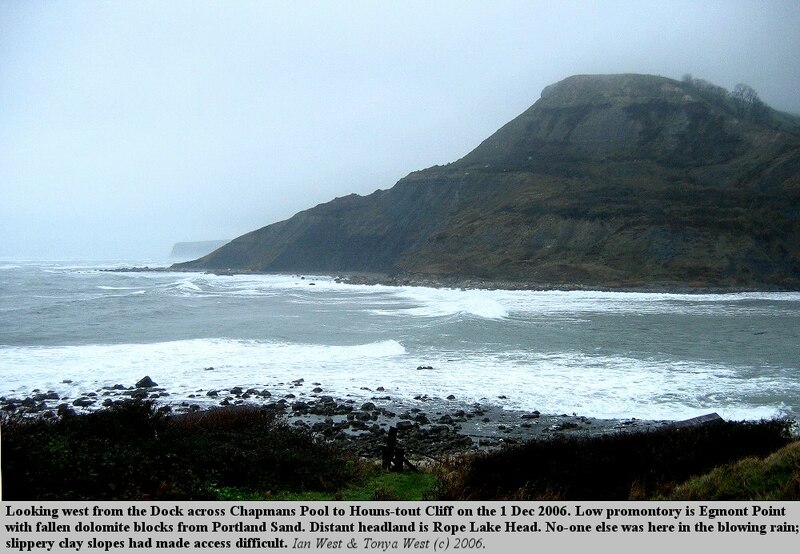 There are number of risks at Chapman's Pool, which are greater in wet or stormy weather. 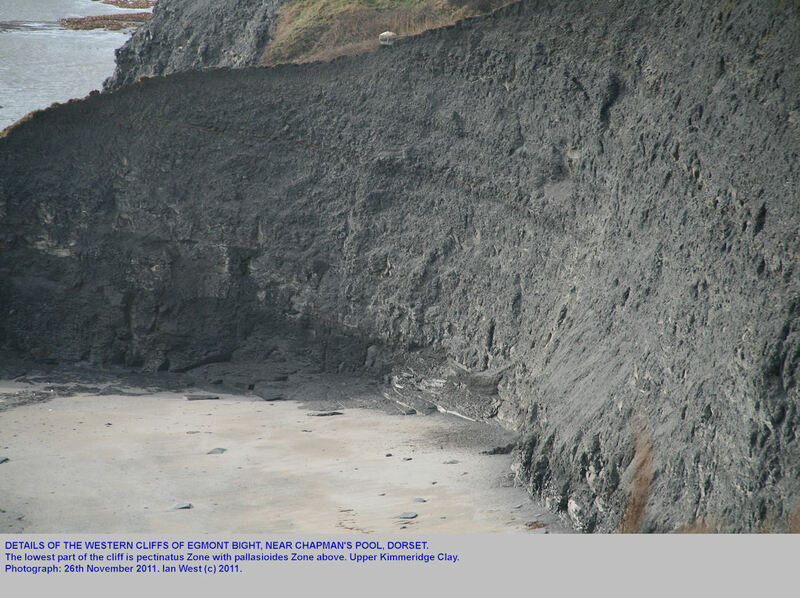 The major risk is of rock fall from the cliffs at the Pool and also at Egmont Bight. Do not linger near the cliffs, keep out near the sea, if you have to go close to the cliffs move past as quickly as possible. Do not hammer the cliffs. Members of parties who intend to work under shale cliffs should wear safety helmets. Watch should be made for fresh fallen shale on the beach, which will indicate particular risk areas. 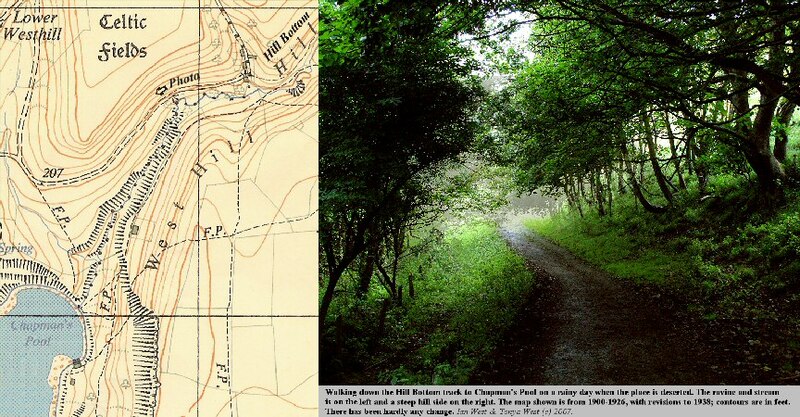 The east-west path on Houns-tout, which once existed, has now disappeared under impassable brambles and is blocked by landslides and boggy mud. There is risk of being trapped in mud here. Houns-tout is now difficult, especially in bad weather conditions. The risk of second-most importance is slipping on shale or clay. Slippery shale and algal-covered rock on the beaches and slope can be a cause of falls, which might on occasions be heavy and injurious. The fallen rocks of Portland dolomite or Portland Cherty Series may be slippery and difficult to climb on. 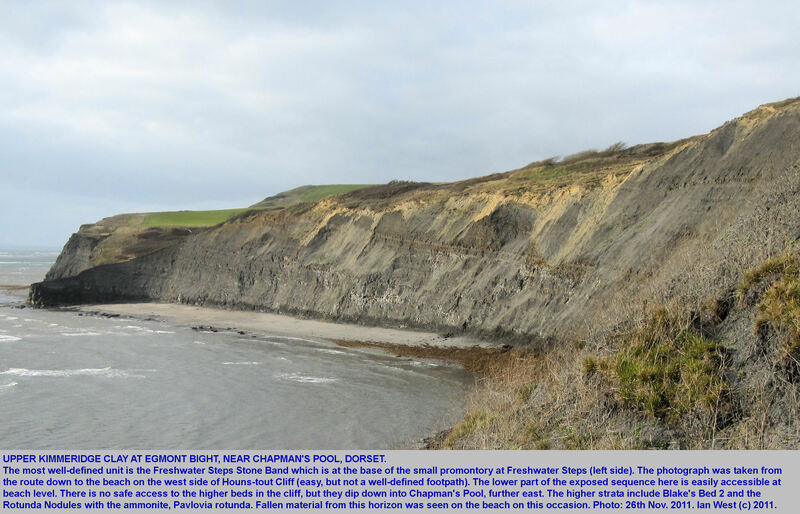 In stormy conditions there is risk from sea waves and Chapmans Pool should not entered during storms, especially at high tide when the waves may reach the foot of the cliffs. These are unusual conditions, though, and the extent of the hazard will be obvious at the time. It is possible to be cut off by the tide at the foot of Houns-tout with no escape upwards because of cliff slopes, dense vegetation and mud. 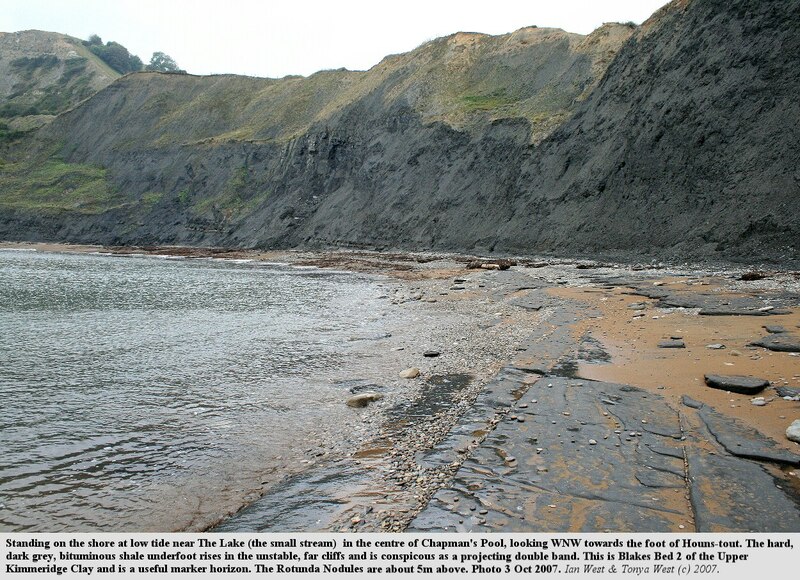 The edges of the shale cliffs above Chapman's Pool are dangerous and should not be approached. The shale is often in a state of near-collapse. The coastal footpath is generally safe but the summit of Houns-tout can be quite wind-blasted in a storm. Keep away from the cliff edge in these conditions, because you may be pushed briefly towards the cliff by a back-eddy. Obviously, in general it is necessary to keep a sensible safe distance from any cliff edge and not try to look over the top. Houns-tout Cliff, especially the upper part, and Emmetts Hill cliff are very steep and are hazardous for climbing. The hard rock at the top of both of these may be loose in places. Cliff climbing should be avoided. 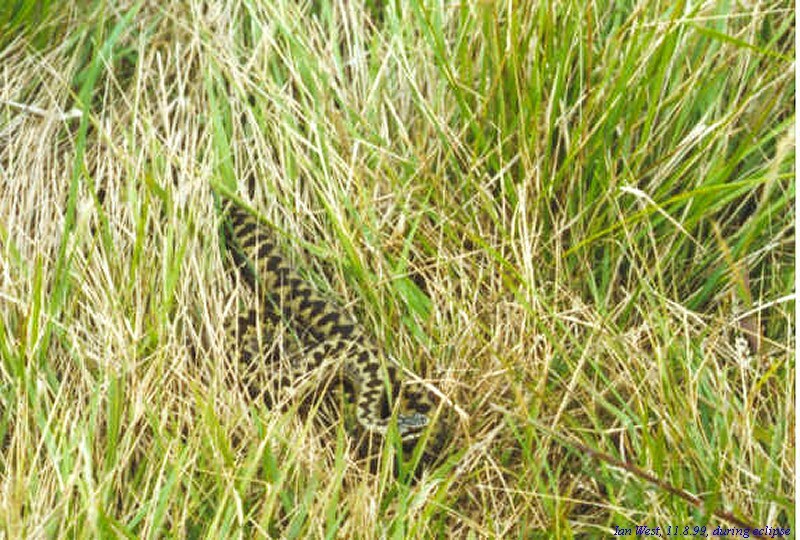 Adders are fairly common in the Chapman's Pool area but are not frequently seen and are rarely much of a hazard unless trodden on or attempts are made to handle them. 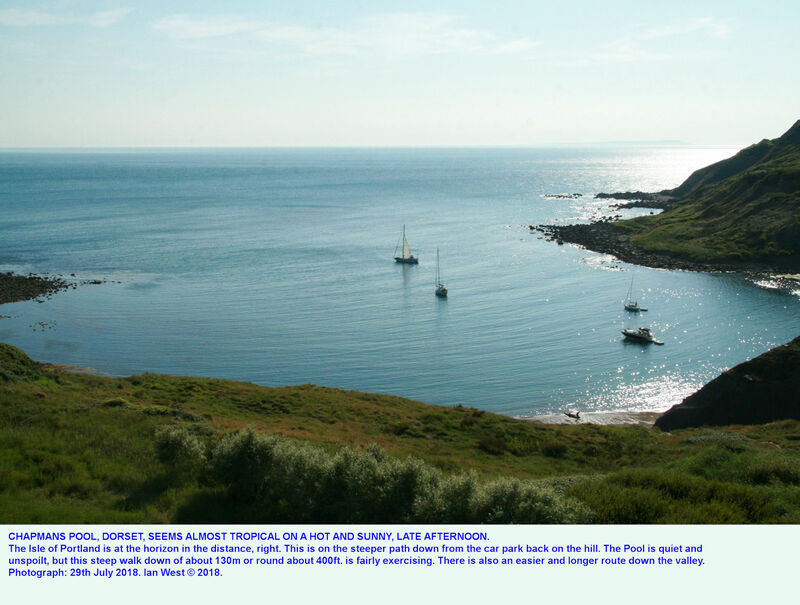 Here is one at Seacombe Bottom, further east. 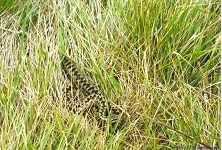 Arkell (1935) drew attention to their relative abundance in the undercliff of Emmetts Hill and elsewhere: " It should be noted that the luxuriant undergrowth and grass here and under St. Albans and Gad Cliffs harbour abundant adders. They are common enough to be dangerous unless gaiters are worn." For more information on risks please read the Safety Webpage . No-one is being advised here to go onto the shore, cliffs or cliff-top area and geologists and walkers proceed at their own risk. This website only provides geological and general information and no liability is accepted. 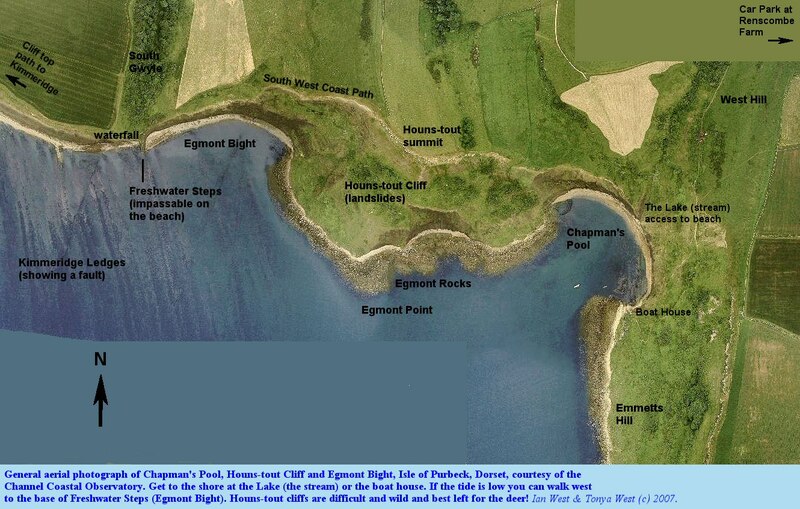 To visit Chapman's Pool, proceed by road to Wareham in east Dorset. Then take the A351 to Corfe Castle, branching right on the Swanage road just after leaving the village. Go to Kingston (map ref. SY 9577960). This is one of the two places from which you can walk easily to Chapman's Pool. Either park at Kingston or continue eastward on the B3069 for about a kilometre before taking the turning right to Worth Matravers, and then on a short distance west to Renscombe Farm (map ref. SY 965775)where this a car park (just to the left of the tarmac road on the track to St. Aldhelm's Head). Alan Ivimey, in his 1959 book 'Pilgrim's Pleasure,' records the grisly evidence of a monastic scandal walled up there: "One day, early in this century, someone decided to cut a new window through the thick farmhouse wall on the west side. As the first stone was pulled away the workmen saw that the wall was hollow and that there was something inside - the golden hair and the face and the black-clad body of a girl. The body, preserved in the limestone, fell to dust as the air reached it. But a crucifix taken from the hollow was long kept, I am told, by the vicar of Langton Matravers - though Renscombe is nearer to Worth. Why was this girl walled up in secret - 'left alone with God' as the men who hid her might have put it. What was going on at this cell of Cerne Abbey, twenty-five miles away?" The access roads are narrow and the road routes and parking are suitable for cars and minibuses. Chapman's Pool is not normally used now by coach parties, and narrow road restrictions may make coach access to the appropriate car parks difficult. The easiest route is from Renscombe Farm, near Worth Matravers, where there is a car park. Follow the road northward through the farm (this later becomes a track) down North Hill to Hill Bottom. Stay on the track down the valley until you come out on the slopes above Chapman's Pool. Footnote: Erosion of the shale cliffs in the Kimmeridge region, including Chapman's Pool is quite rapid, probably about a quarter to a half a metre per annum. In Roman times the coast around Houns-tout must have been further out, perhaps even to half a kilometre. 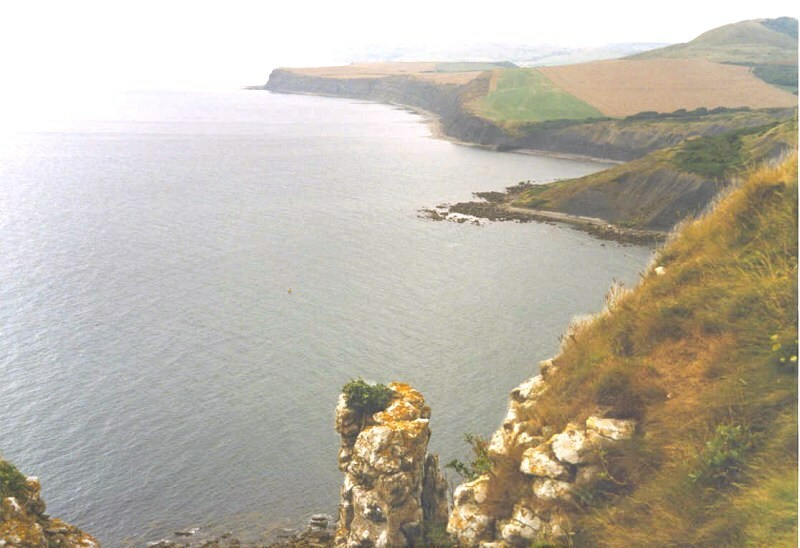 Houns-tout may have been a just a coastal hill, like Swyre Head, rather than a cliff at that time. The Romans may have had easy access from the valley that is now Chapman's Pool to the Kimmeridge oil shale workings on the shore. (In 1945 someone claimed to have encountered a Roman centurion walking alongside him on the track down to Chapmans Pool!). At the seaward end of the track look for the permissive path on the left down to the Pool. It is usually easy to descend to the shore in dry conditions, unless coast erosion has cut the path too much at the bottom (in which case walk on for access at the boathouses). In wet weather the path can be extremely slippery with a wet and steep clay slope at the base, and it can be difficult or impossible to reach the beach at times. Once on the shore, beware of the hazard of cliff falls and stay out away from the cliff as far as possible. If you leave a car at the car park near Renscombe Farm you can make a direct descent via West Hill. However, in wet weather this can be a very muddy activity. The upper part of the hillslope is stony and gives a grip. 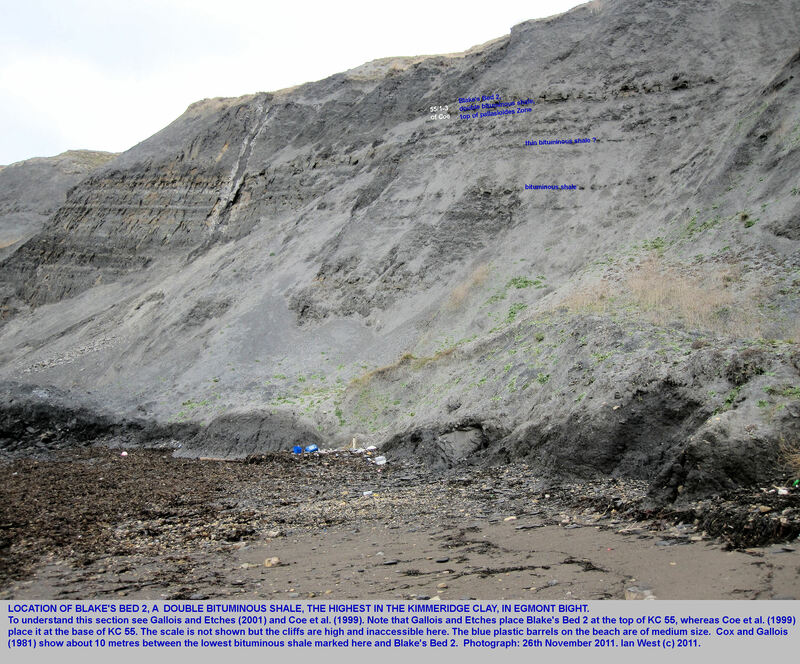 Lower down on the Kimmeridge Clay you may slip on steep soft mud and receive a covering of yellow mud. Ascent can also be difficult in wet conditions. No major difficulty is expected in dry weather, although this route is energetic. 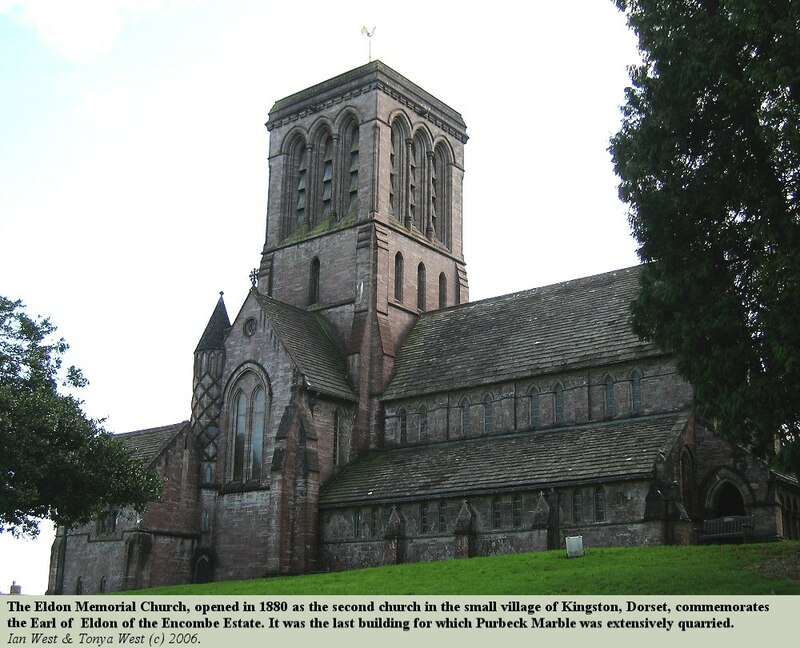 From the village of Kingston, with its two churches, there is an easy walking route directly south. Proceed past the Eldon Memorial Church down the narrow road with Westhill Farm and Westhill Wood on the right. It will take about 35 minutes of easy walking to reach the valley slopes above Chapmans Pool (not the summit of Houns-tout, which is above). There is a nice scenic footpath on the hill top roughly parallel to this but a half a kilometre further west. It goes past Quarry Wood to Houns-tout summit. From the centre of Kingston proceed by car or walking a short distance further west into the Plantation (part of the Encombe Estate). There is a car park here, although it is rather secluded and hidden in the wood. It might not be ideal if you are concerned about property within the car - leave it empty or leave it at Kingston. There is a sign post to Houns-tout through the wood, which is full of Hart's Tongue Fern and an interesting variety of trees. At Quarry Wood you come out above a very steep valley with an obelisk on the far side. Then walk on past Encombe House with a fine view across the valley with Golden Bowl and Swyre Head beyond. "At a height of 240 feet, and half a mile from the edge of the cliff, remains of the undermentioned animals, which I saw in the collection of the late Lord Eldon, were found: - Elephas primigenius, Rhinoceras tichorhinus, Cervus tarandus (? ), Equus and Bos." The path leads on alongside a drystone wall past Encombe Dairy in the valley and then South Gwyle. 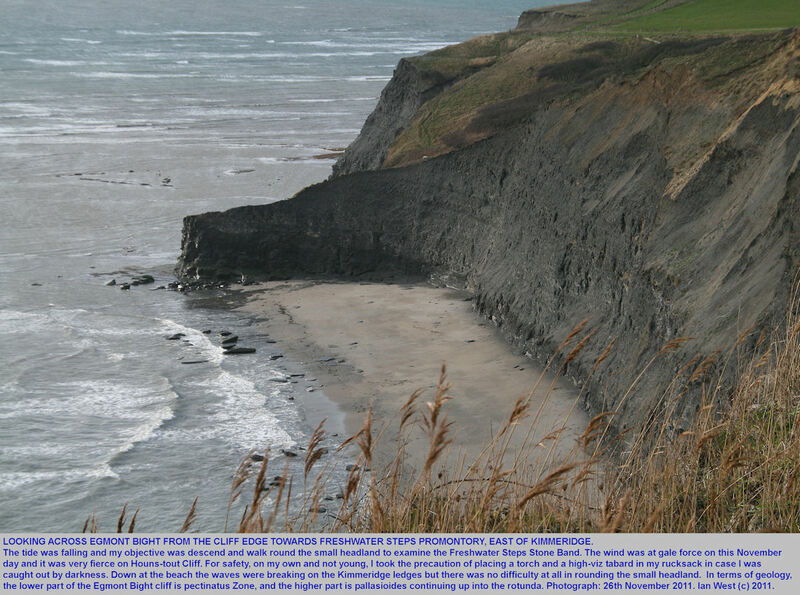 There is a good view of the Kimmeridge coastline with Gad Cliff in the distance. About 30 or 45 minutes after starting you will arrive on the wind-blasted summit of Houns-tout. 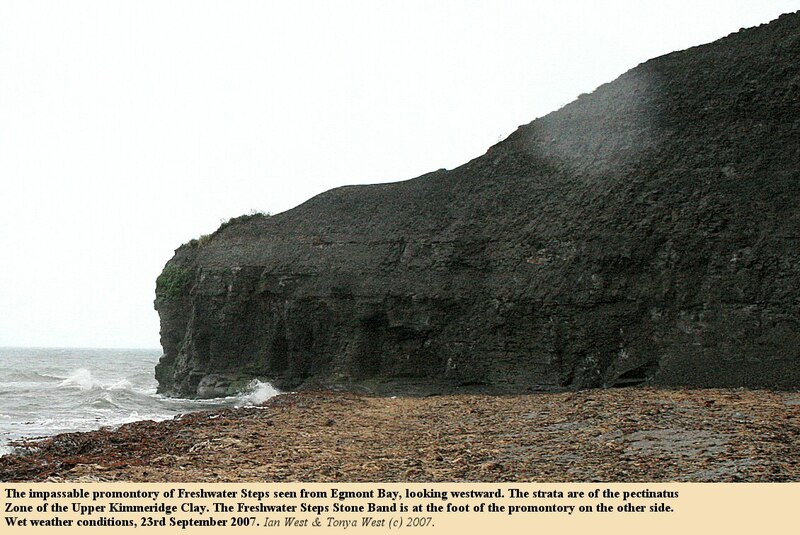 From here there is a magnificent view of the Kimmeridge shale cliffs and the Freshwater Steps promontory. Over the brow to the east is a long series of stone steps down into the valley above Chapman's Pool. 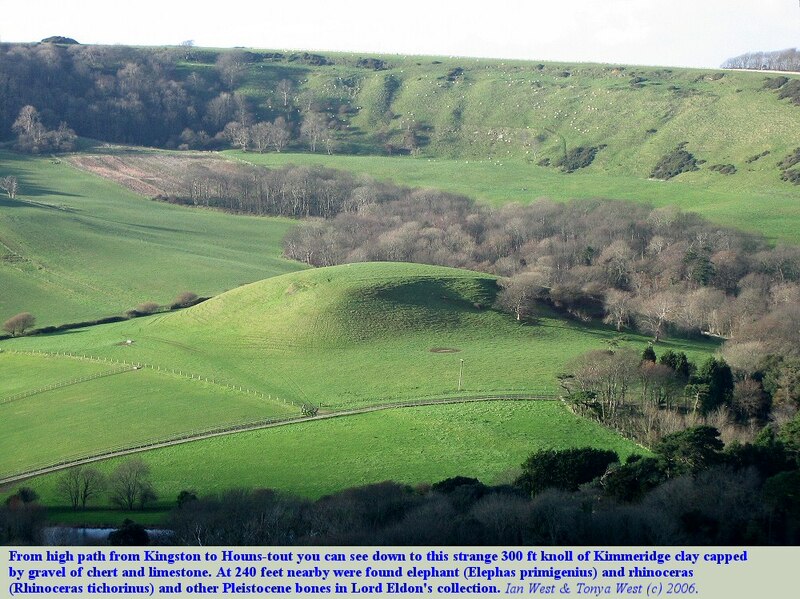 This is one of the best walks in Dorset and part of a circular route. You can of course take this as the outgoing or return route, but note that the summit of Houns-tout is about 150 metres above OD and the ascent up the final range of steps is steep and energetic. To get to the beach (by a permissive footpath) you must walk down a muddy and slippery path next to the stream and on the Kimmeridge Clay. It is not difficult in dry weather, but can be treacherous when the clay is very wet (easier with trekking poles). The final muddy slope may be difficult to descend or ascend. However, there is also a route to the beach at the Boat Houses or Dock, further to the southeast. The location is reached by a muddy old road, part-way up the cliff on the east side of Chapman's Pool. In case of difficulty with tides it may be possible to ascend or descend the lower slopes of Houns-tout, but this is not recommended because of landslides, and obstructive brambles, and you may get stuck in soft mud. It is now almost impossible, to get up the eastern part (the old coast road and subsequent path have now gone). Further west it is still possible, at present, to scramble up old landslides at the eastern end of Egmont Bight, although there is no good footpath. From these landslides a rough walk out westward at the mid-Houns-tout level to the coast path (Freshwater Steps to Houns-tout summit) can be made. This escape route is certainly not recommended for general access, but might be used in an emergency. If conditions are very slippery or if there is particular risk of cliff fall, then you may wish to examine the coast from the cliff tops. The coastal footath is steep and energetic for walking in parts, but not at all difficult except in severe storm conditions. Do not consider descending the seaward face of Houns-tout from the summit rocks! I never do this nowadays; there other and safer methods of gaining access to the strata (which I will explain). It is extremely dangerous to attempt to descend the central arrete of marl; you have both considerable risk of falling on the slippery slope and of having rock falls onto you (the top dolomite is now unstable). 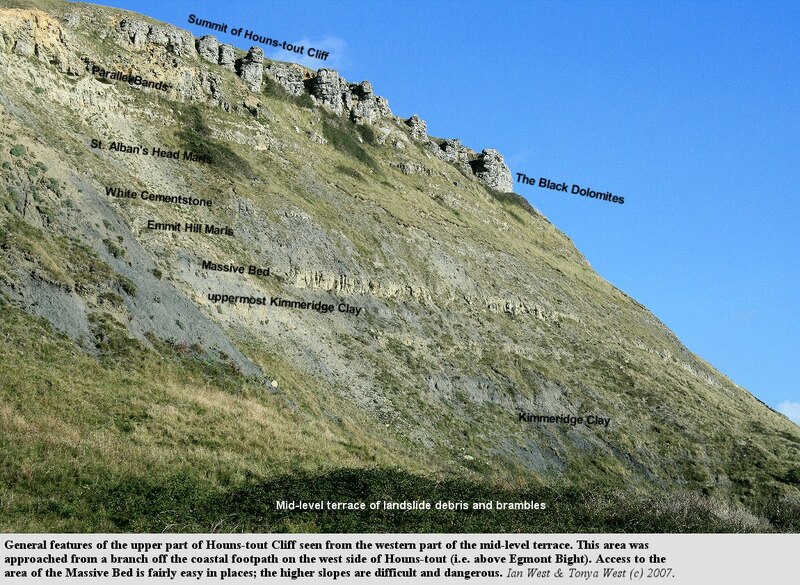 Cliff section are shown above for a large part of the Kimmeridge Coast and for the Hounstout cliffs more specifically. Diagrams are based on Arkell (1933), Cox and Gallois (1981) and other information. 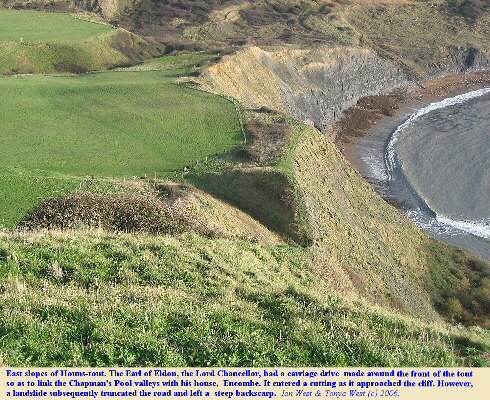 The succession in Hounstout Cliff, is also shown in the photograph above. 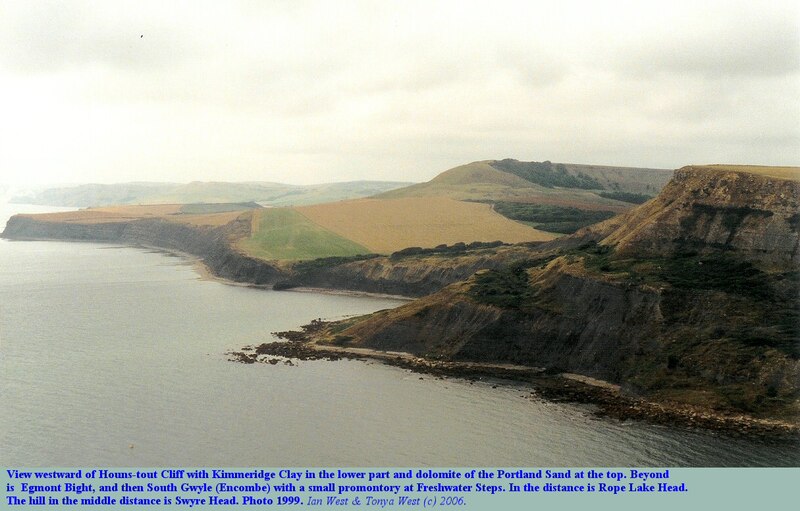 This cliff section shows the main units at the top of the Kimmeridge Clay and in the Portland Group from Freshwater Steps to St. Aldhelm's Head. 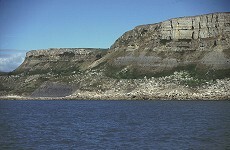 The cliffs rise to a summit plateau of about 120m. 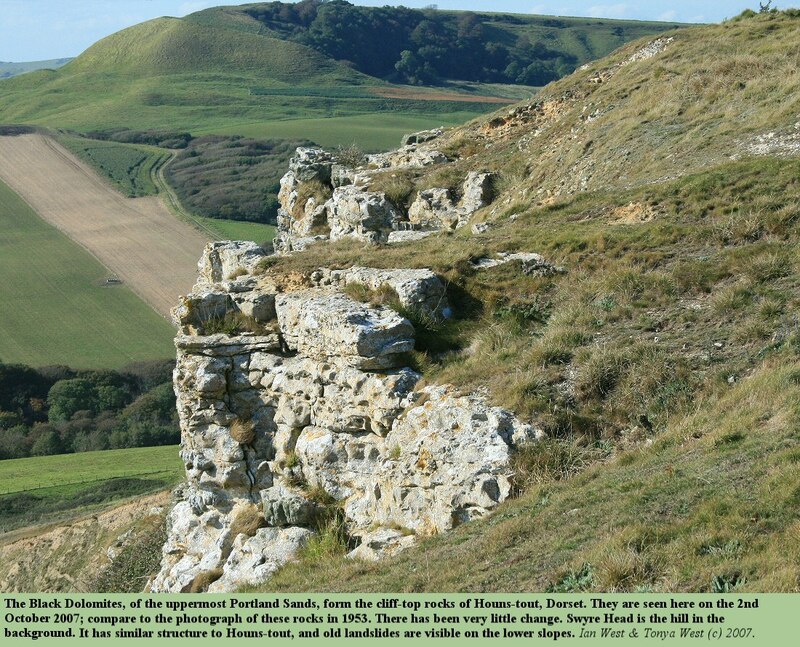 There is much landslipping, but Houns-tout cliff provides quite a good exposure from the Kimmeridge to the Portland. Chapman's Pool is notable for the crushed ammonites seen on shales exposed on the shore, and for the white, solid body-chambers of of the ammonite Pavlovia (see below). There are various fossils, including ammonites, in the Portland Sand, and there is the interesting curiosity of poikilotopic black calcite crystals in the dolomite beds. 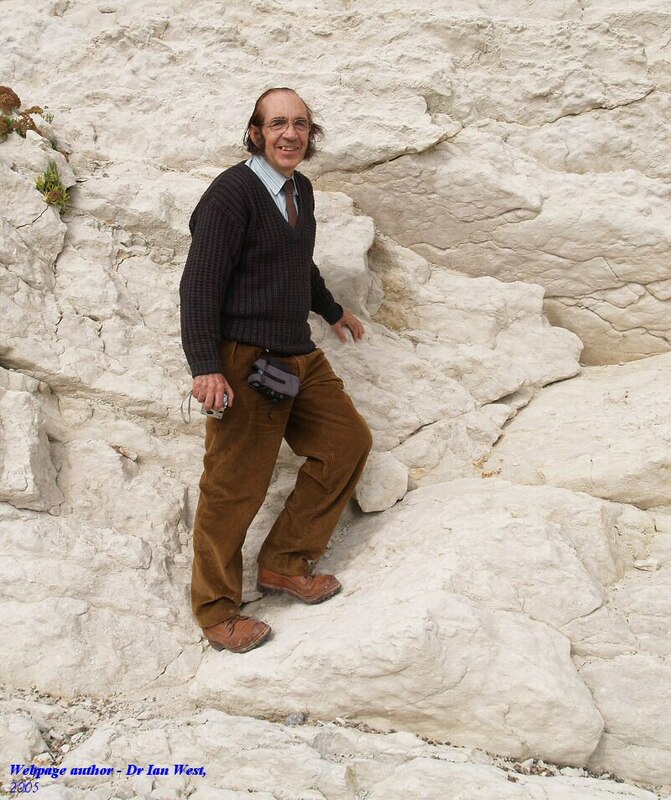 Townson (1975) ascribed these to dedolomitisation and records some celestite. Serpulitic chert is an interesting feature of the top of Houns-tout cliff. More details will be given with photographs. The passage of the Upper Kimmeridge Clay into the Portland Sand is seen here in Houns-tout Cliff. 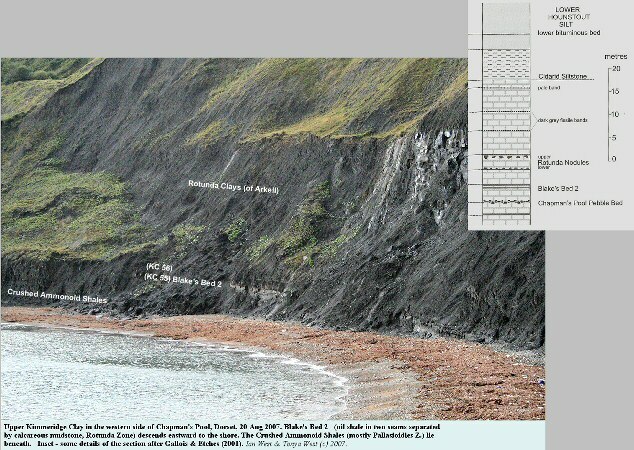 It is a shallowing-up sequence from the organic-rich shales of the Kimmeridge Clay into the Portland Sand marls with occasional sandstones. Dolomites (the Black Sandstones in old literature) follow and form the top of the cliff here (with the basal Portland Stone). Stratigraphically above are the limestones of the Portland Cherty Series, better seen at St. Aldhelm's Head. 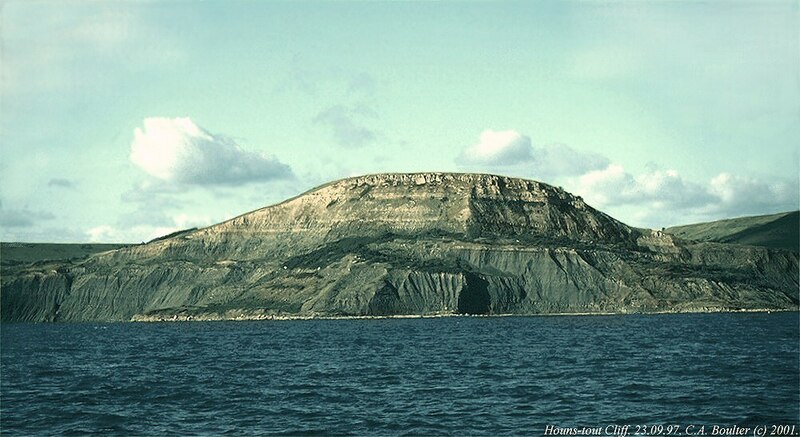 The west side of St. Aldhelm's Head and Emmetts Hill is seen here from the sea in a photograph taken by Dr Clive Boulter on 23rd September, 1997. 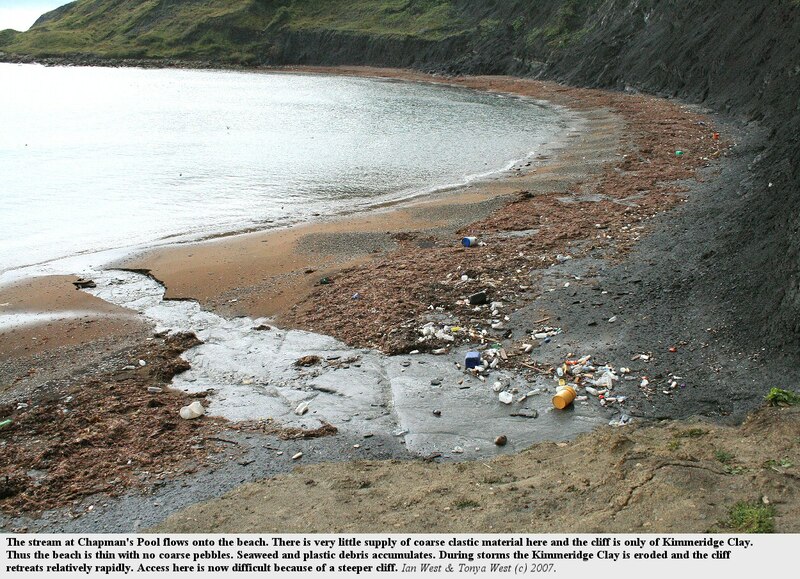 The lower part of the cliff, partly covered by fallen debris consists of the uppermost part of the Kimmeridge Clay. Above this the Portland Sand occurs. This is mostly mudstone and marl in the lower part in spite of the name, but a sandstone bed, known as the Massive Bed marks the junction and can be seen in the photograph. Some way above is another good marker, the White Cementstone. 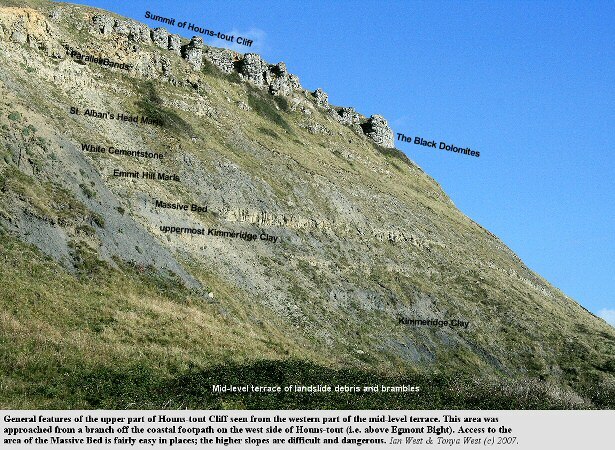 Higher in the cliff, above the marls are the "Parallel Bands" and the "Black Sandstones", of Arkell (1947). These are actually beds of dolomite. The Portland Cherty Series follows. Notice the dissolution (karstic) features with yellow sandy debris at the top of the cliff on Emmetts Hill. The valley is Pier Bottom and has been truncated by marine erosion and left "hanging", that is with its base above sea-level. Large rectangular blocks of limestone seem to form a natural sea-defence or barrier except at Pier Bottom where this stone is not available. 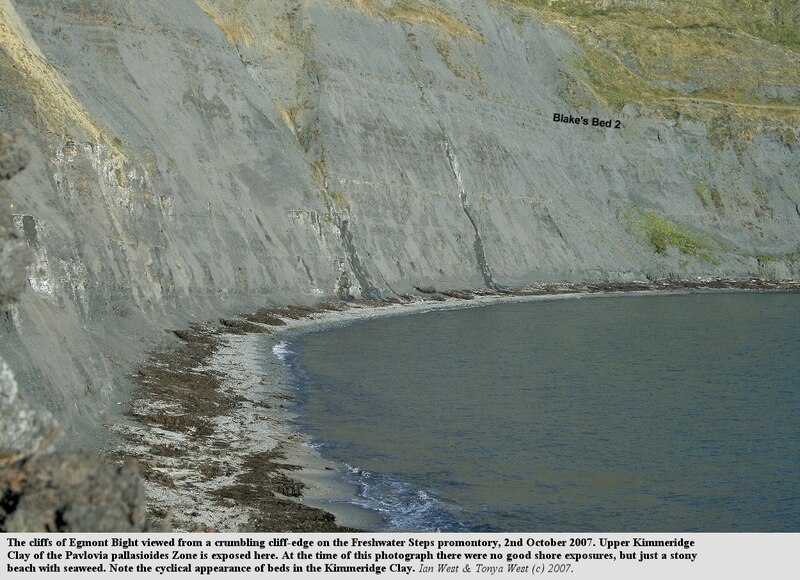 Here there is a shale cliff in the Kimmeridge Clay. More information on the Portland Group and an alternative set of names is available in Townson (1975). Here is a view of Egmont Point from Emmetts Hill in the east. The rocks at this clay headland consist of Portland Stone and dolomite and have fallen from the summit over a period of time. Freshwater Steps, beyond, is a small and relatively low headland with a waterfall at the promontory. It is at a valley with a green field clearly visible in the photograph. The far distant headland, with ledges at its foot, is Rope Lake Head. In the foreground on Emmetts Hill is the capping of Portland Stone, weathered and with an irregular karstic surface. It is favourable for the growth of lichens. Gallois, R. and Etches, S. 2001. The stratigraphy of the youngest part of the Kimmeridge Clay Formation (Upper Jurassic) of the Dorset type area. Proceedings of the Geologists' Association, 112, 169-182. 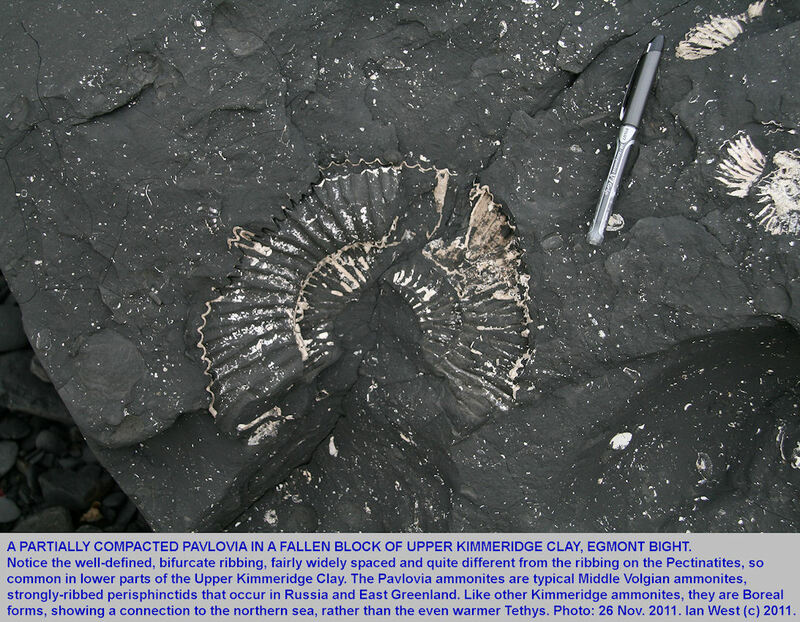 By Ramues Gallois (Exeter) and Steve Etches (Kimmeridge). Abstract: The stratigraphy of the youngest part of the Kimmeridge Clay Formation (Upper Jurassic) of the Dorset type area. 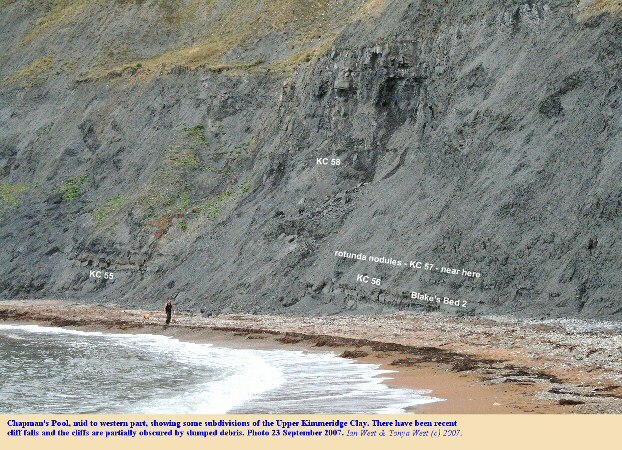 The lithostratigraphy of the youngest part of the Kimmeridge Clay of the stratotype section at Houns-tout/Chapman's Pool in south Dorset is described in detail for the first time, and is the correlated with other current exposures in south Dorset and with borehole sequences in more distant areas. The stratotype section, albeit deeply weathered in part, is the only complete succession in Britain through this late Jurassic interval. It remains of key importance to international correlation of the Boreal, Sub-boreal and Tethyan faunal provinces at this stratigraphical level and to the resolution of the debate concerning the boundaries of the Kimmeridgian, Tethyan and Bolonian stages. 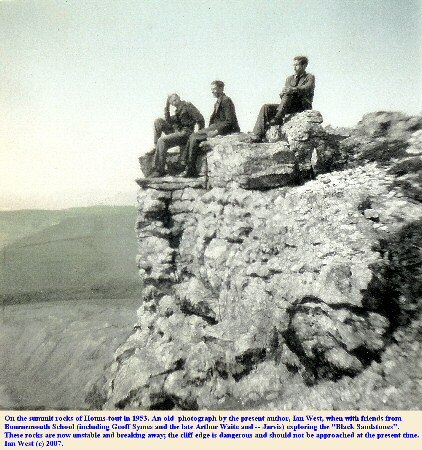 A very useful photograph in this paper, and used for the cover of the issue of the Proceedings of the Geologists' Association is fig 6, of page 177. This has the numbered Kimmeridge Clay beds from KC 54 to KC 63 shown. An important diagram is fig. 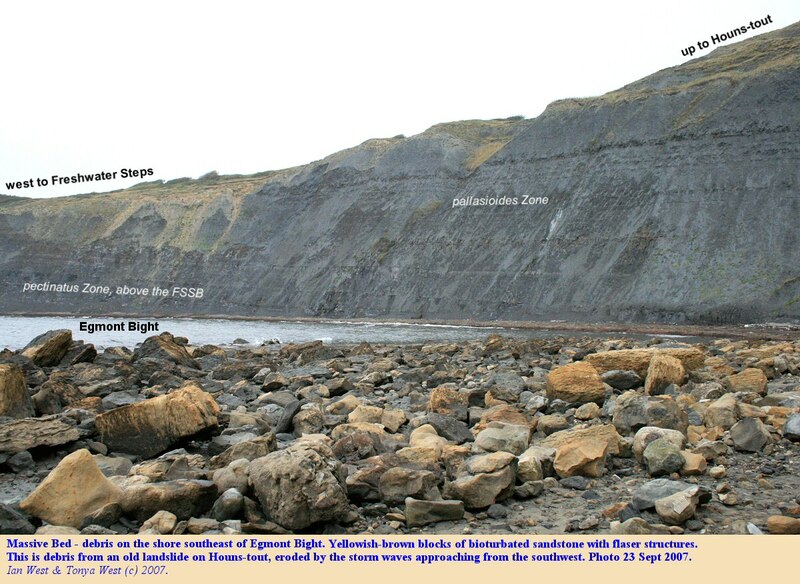 3 which shows the Houns-tout and Chapman's Pool Kimmeridge Clay sequence alongside that of Swanworth Quarry No. 1 Borehole which penetrated the same strata. The following sequence is based on older work. This should be compared to the scheme of Gallois and Etches (2001). The listing below, in descending sequence from the Massive Bed (basal Portland) is based with modifications, on Arkell (1947) and on Cope (1978). The bed numbers are of Blake (1875; 1880), which increase downwards, unlike the modern system. Thicknesses are in metres, as remeasured by Cope. A conspicuous and projecting sandstone marking the base of the Portland sequence. Easily seen at about the middle of Houns-tout Cliff. Variable pale and dark silty clays with three more sandy, yellow-weathering, indurated bands near the middle. Various partings visible within the thickness. At the base - upper line of seepage on Houns-tout Cliff. Dark silty clays and mudstones, occasional more bituminous layers. Virgatopavlovia fittoni, V. hounstoutensis, Palovia spp. etc. At the base - lower line of seepage on Houns-tout Cliff. Monotonous dark silty clays and mudstones. Virgatopavlovia fittoni, V. hounstoutensis, Pavlovia spp. etc. Rhynchonella subvariabilis. The bivalve Oxytoma and small belemnites occur in the Rhynchonella Marls. Monotonous dark silty clays and mudstones, passing down into shales. Shales and clays with layers of crushed white, aragonitic, ammonites. 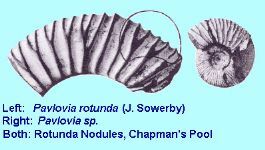 Pavlovia rotunda, P. concinna, P. spp. indet. Hard calcareous nodules in clay. The nodules occur in at least two lines, the upper nodules are vertically elongated. The Pavlovia ammonites are strongly ribbed perisphinctid ammonites, referred to in the old literature as Ammonites biplex , but are now in a Russian genus. For illustrations and more information see below . 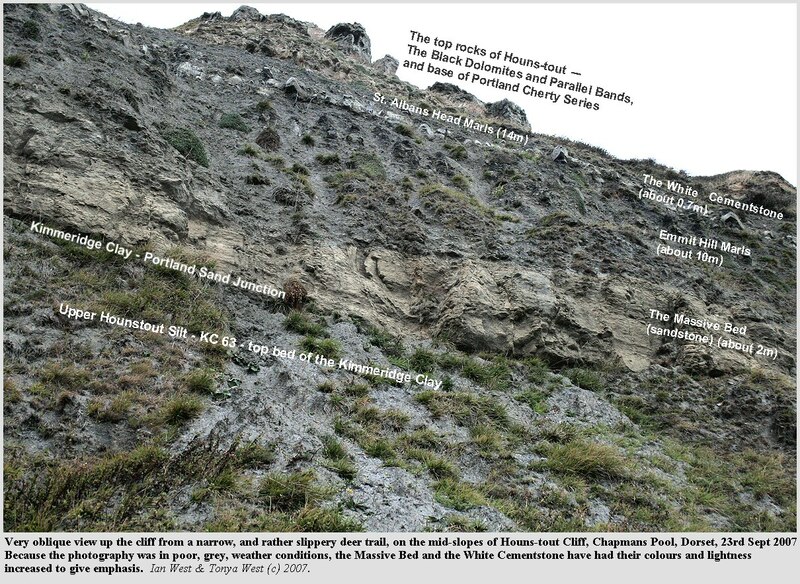 The white body-chambers of the ammonites are sometimes visible in the cliff at this level. Parts of the ammonites are preserved in uncrushed form because of the early development and lithification of the small nodules of septarian type. 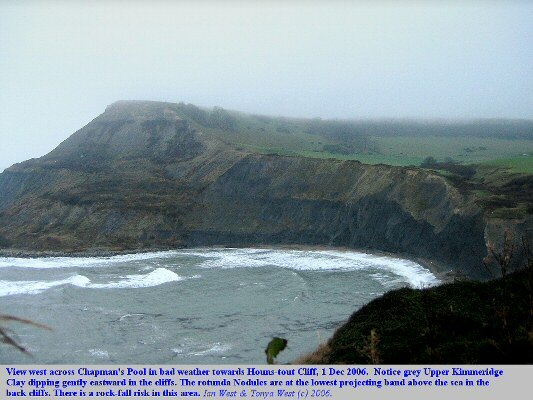 The Rotunda Nodule Bed is well above the beach at the Houns-tout side of Chapman's Pool but descends with the dip eastward, reaching the beach near the boathouse. 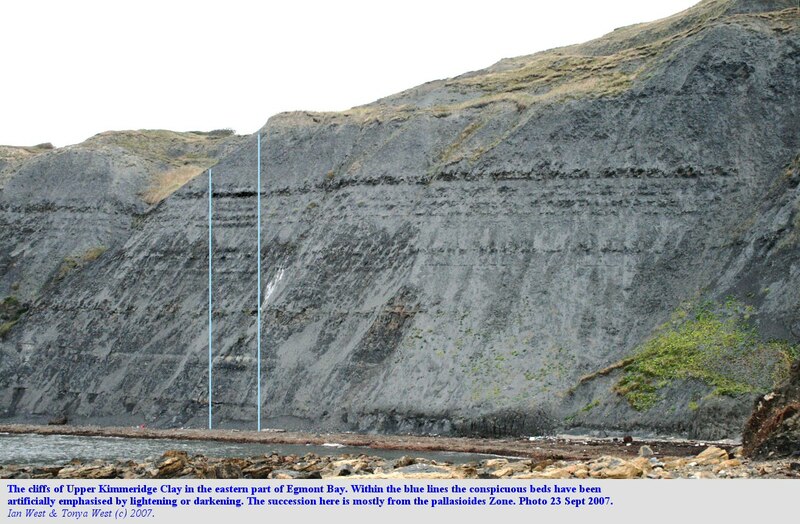 These beds are 33.22m thick according to Arkell (1947). Most of these shales belong to the Pavlovia pallasioides Zone and the zone fossil occurs in most of the beds. Reference should be made to Cope (1978) for more information. 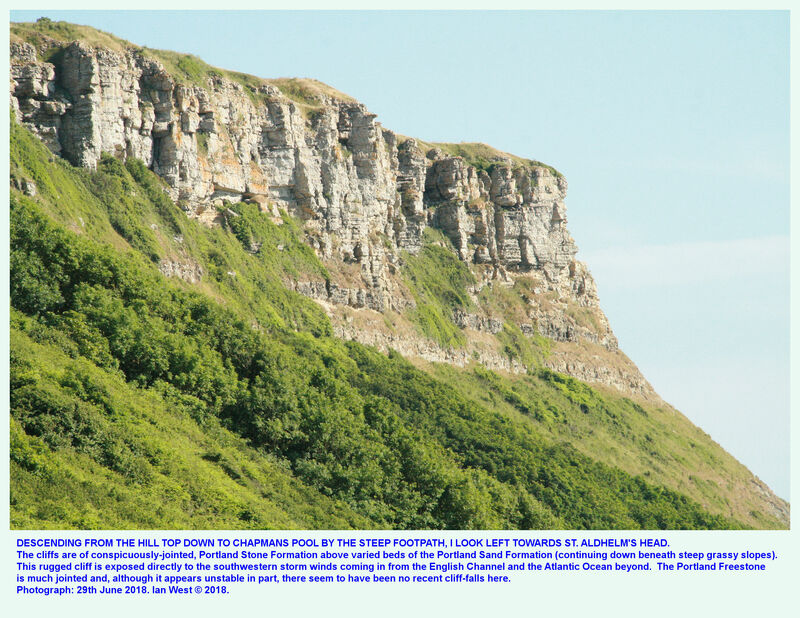 Please see the section on Chapman's Pool Cliffs (below) for more detail. 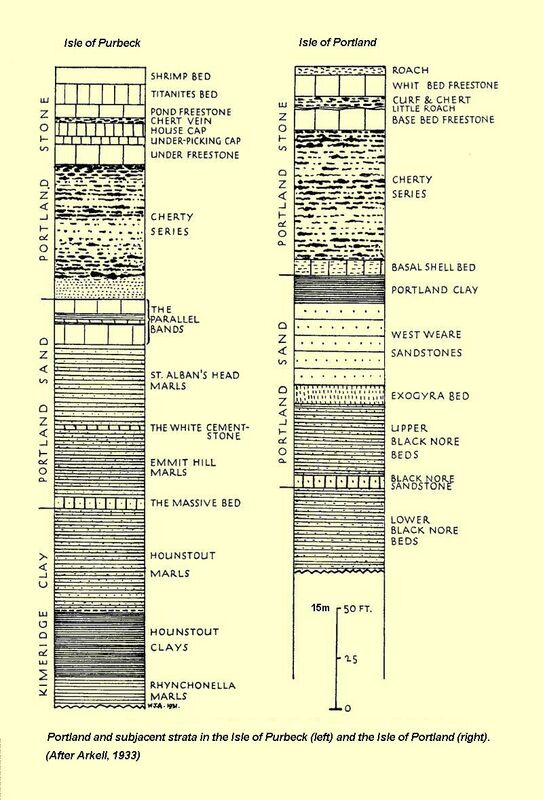 For the Portland Sand of Hounstout Cliff reference should be made to the sedimentological study of Townson (1975) and the older stratigraphical work of Arkell (1947) etc. Above is a classic diagram, based on Arkell (1933) and repeated in Arkell (1947) and other publications. 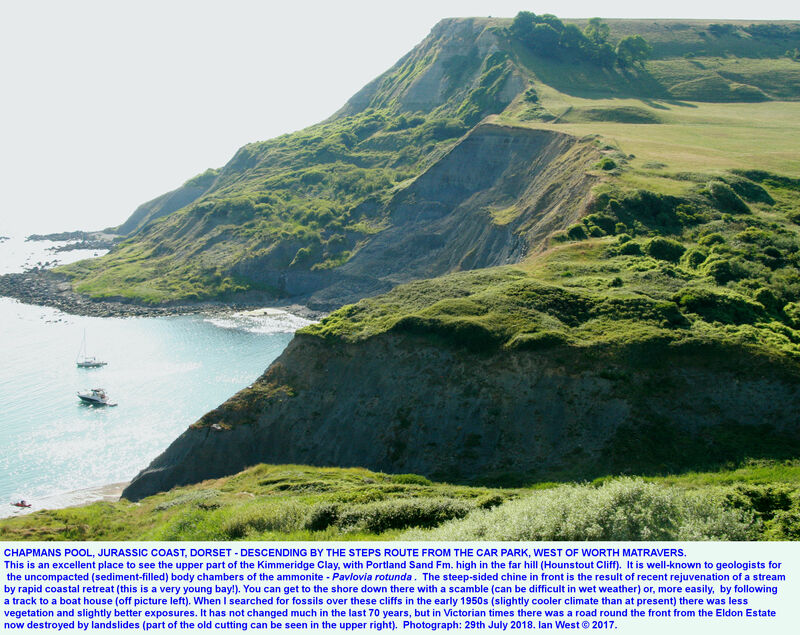 It shows the general uppermost Portland (top Jurassic) succession at Houns-tout Cliff and the St. Aldhelm's Head area, compared to that of the Isle of Portland. It is very useful in the field provided it is noted that the Parallel Bands and the "Black Sandstones" are actually dolomite. 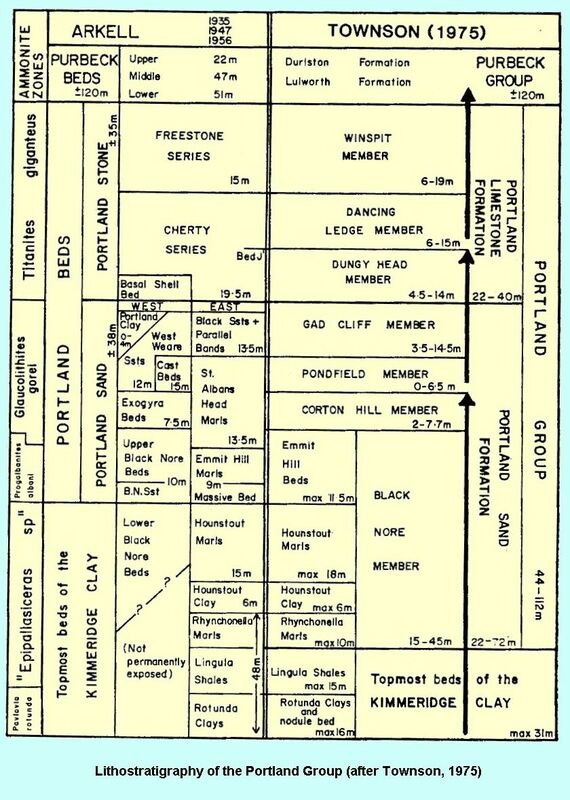 It must also be appreciated, that the old name "Portland Sand" is also a misnomer, because it is, in fact, largely comprised of marls with some sandy horizons. The Portland Stone consists of the Portland Cherty Series overlain by the Portland Freestone, mostly intrasparite limestone in eastern Isle of Purbeck, but oolitic at Lulworth and on Portland. Only the base of the Portland Stone is present at Chapman's Pool, but study of this can be made at St. Aldhelm's Head. 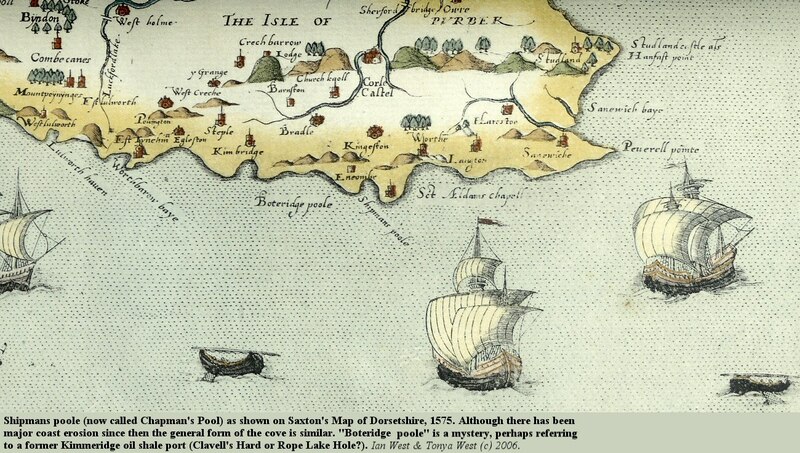 Two alternative schemes for the terminology of the Portland and Purbeck successions are given here. Townson (1975) introduced a largely new terminology. However, it has not been widely used and the traditional scheme of Arkell, shown on the left is still in more common use (diagram after Bosence, 1987, from Townson, 1975). See Wimbledon (1987) for some discussion of this, and note also that some correlation problems which affect this are discussed in the section on zones, below. Wimbledon and Cope (1978) revised the ammonite zones of the Portland Group. 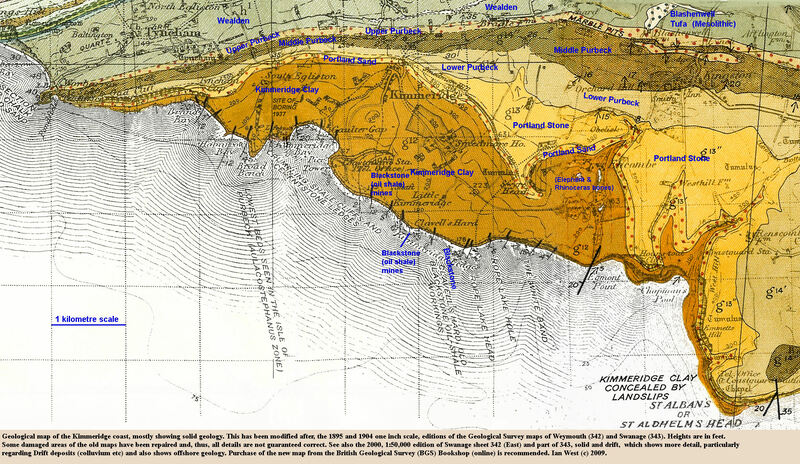 Their ammonite zones are listed below with the oldest at the bottom. 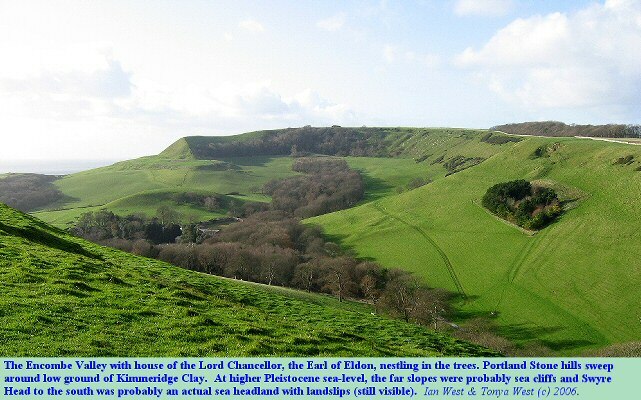 They are discussed here, only with reference to the Chapman's Pool and St. Aldhelm's Head region. For more information go to the Isle of Portland webpage. The Portland Freestone mostly belongs to this zone, although may start earlier, in the kerberus zone in the Isle of Purbeck. T. anguiformis, the fine-ribbed, evolute Titanites is probably the common giant ammonite of the Portland Stone (Wimbledon and Cope, 1978). This is common in the Upper Cherty Beds of the Isle of Purbeck. 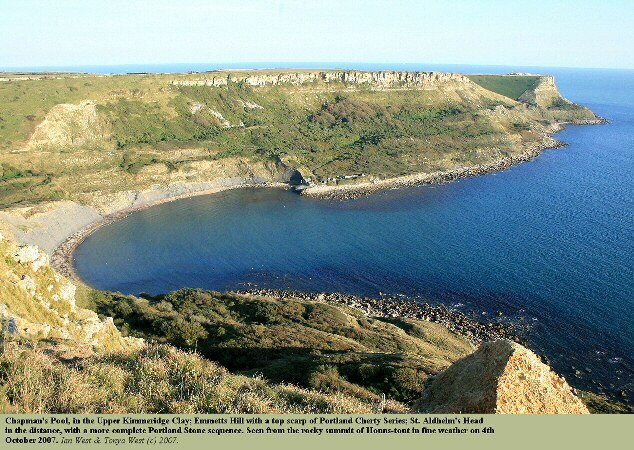 It occurs from the Basal Shell Bed of Portland and from the Prickle Bed or Puffin Ledge (J-J1) of the Isle of Purbeck according to Wimbledon and Cope (1978). This is present in the Black Dolomites ("Black Sandstones") of Purbeck The dolomitisation renders the fossils poorly preserved and difficult to extract. Thus Wimbledon and Cope have defined the base of the zone in the Swindon region and not in Dorset. The base of the Zone is defined as the first appearance of the species of the genus Glaucolithites. The type locality for the Zone is Houns-tout Cliff. The White Cementstone with G. caementarius fixes the base of the Zone according to Wimbledon and Cope (1978). Wimbledon and Cope (1978) defined the base of the Zone as the first occurrence of the genus Progalbanites. The type section is at Houns-tout Cliff Purbeck. The Massive Bed is the lowest horizon with Progalbanites. This sandstone was taken as the base of the Portland Group by Arkell, by Wimbledon and by others but not by Townson, who took the base of the Portland Group as the base of the Rhynchonella Marls. This lower base has not proved popular and it is simpler to use the easily recognised Massive Bed as the base of the Portland. The ostracod fauna ties in quite well with this use of the Massive Bed datum. 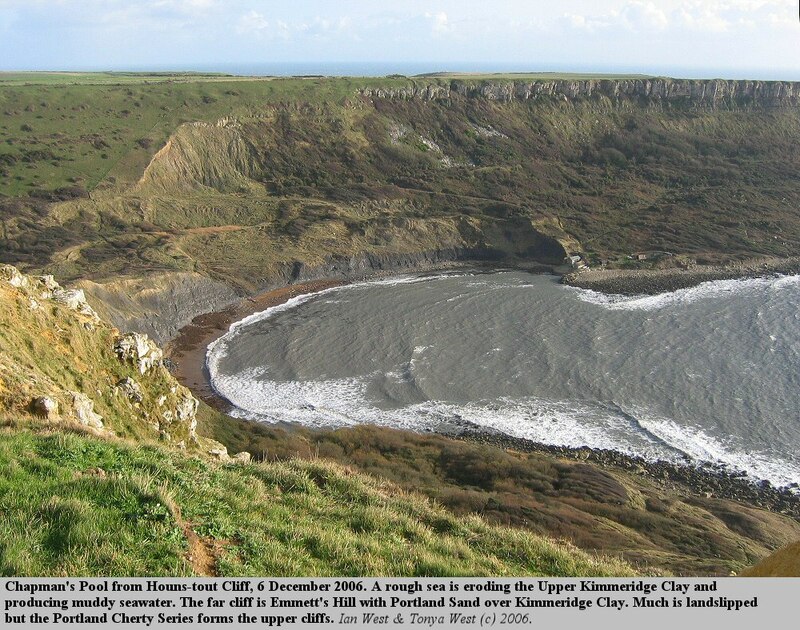 Barker (1966) studied the ostracod fauna of the Portland strata and extended his study down into the uppermost part of the Kimmeridge Clay. 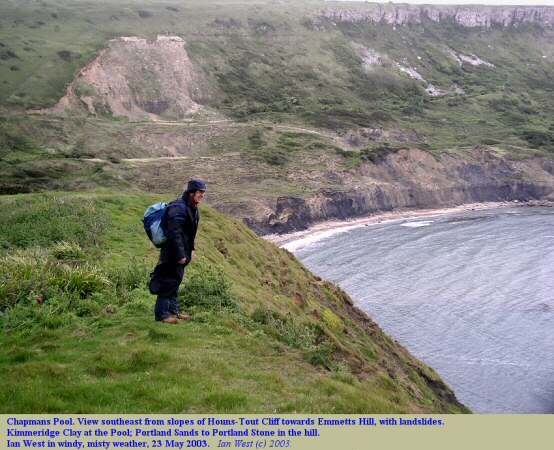 He noted that in Dorset the first occurrence of typical Portlandian species is 0.3 metres below the Masssive Bed at Houns-tout Cliff and the equivalent Black Nore Sandstone at West Wear Cliff, Portland (Wilkinson, 2007). The fauna included Macrodentina transiens (Jones), Macrodentina retirugata (Jones), Macrodentina rudis Malz and other species. 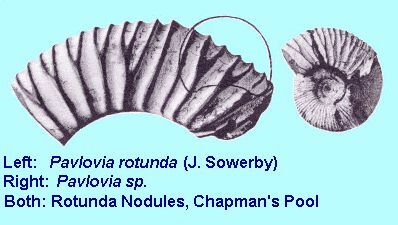 Pavlovia rotunda is an ammonite usually only found in incomplete form as parts of whorls in the Rotunda Nodules of the Upper Kimmeridge Clay at Chapman's Pool. The originally mud-filled body chamber has often been cemented into a nodule at an early stage before compaction. This part is thus preserved uncompacted. Only occasionally are the empty inner whorls also preserved by such early cementation. The aragonitic shell now consists of white powdery material, like chalk. This aragonite has presumably lost its organic binding material and, thus, resembles the "perished bivalves" (aragonitic shells) of the Purbeck Formation of Dorset. 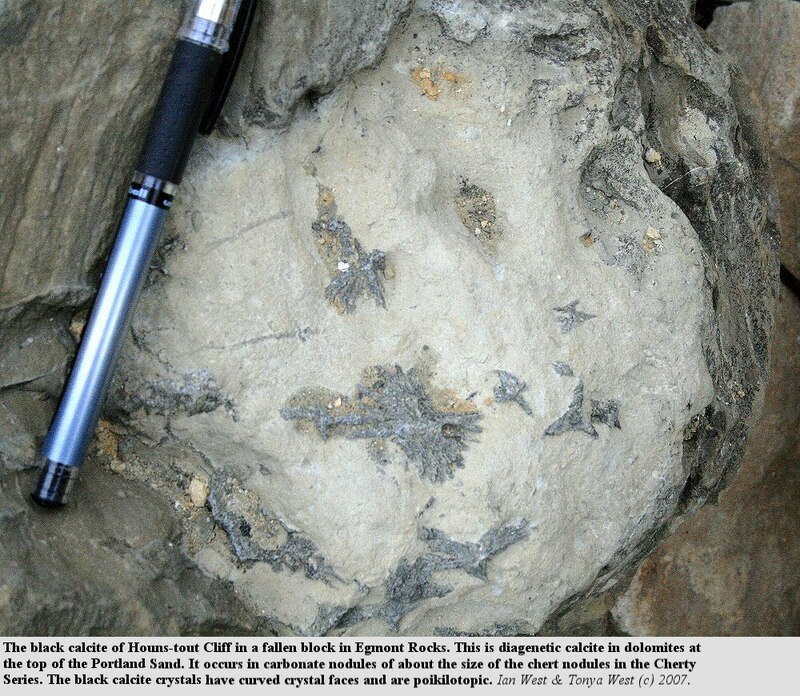 Preservation of aragonitic in the British Jurassic strata usually requires the presence of shales which are to some extent bituminous, as in the case of the rotunda Nodules. 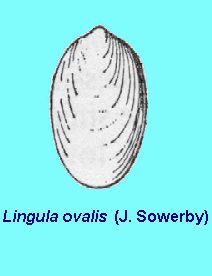 Also shown above Pavlovia rotunda gibbosa (Buckman, 1926), a subspecies of Pavlovia rotunda (Sowerby, 1821). It was described in detail by Cope (1978) and this image is after a photograph of his. He commented that whilst the common P. rotunda was mature at about 100 to 120mm diameter, this subspecies was larger, reaching maturity at an estimated 300 - 400mm diameter. It was clearly quite a large ammonite. 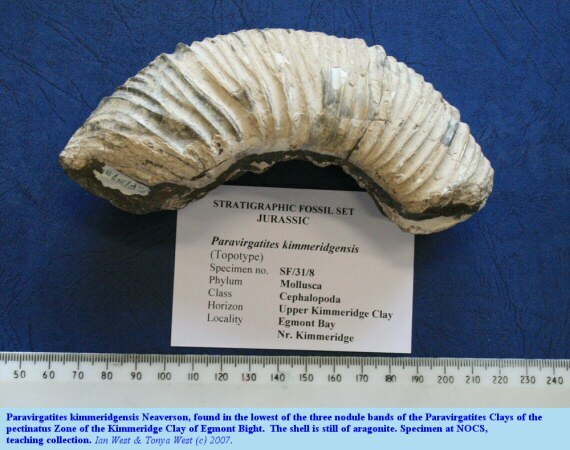 The specimen shown is entirely phragmocone, which explains its preservation. Sediment would have had access to all parts because the interior was not closed off by septa. There was again, presumably, early cementation to form a nodule. The stratigraphical range of Pavlovia rotunda gibbosa is: Upper Kimmeridgian, rotunda Zone, occurring in the rotunda Nodule Bed. 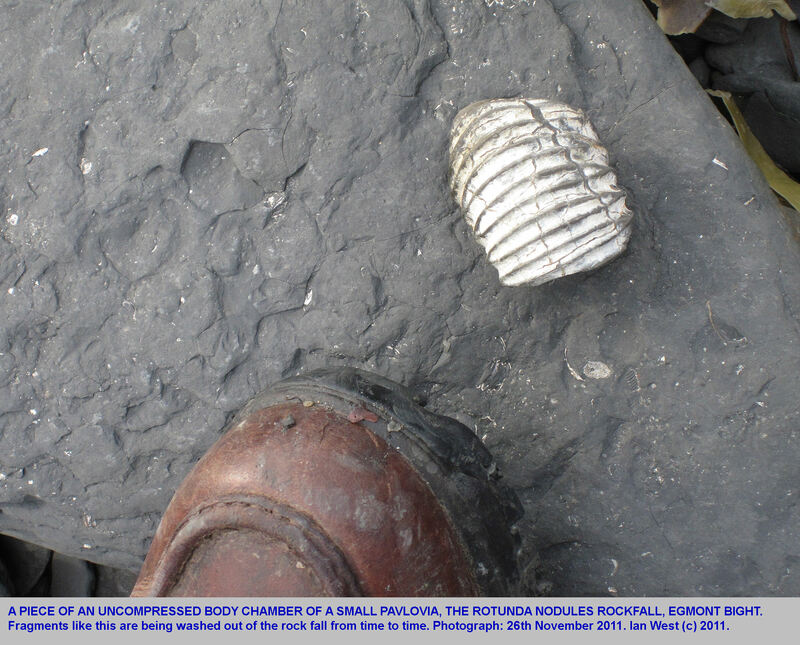 Left: Lingula ovalis Sowerby, a brachiopod which occurs in the Lingula Shales, uniform very calcareous mudstones near the top of the Kimmeridge Clay in Hounstout Cliff, west of Chapman's Pool. 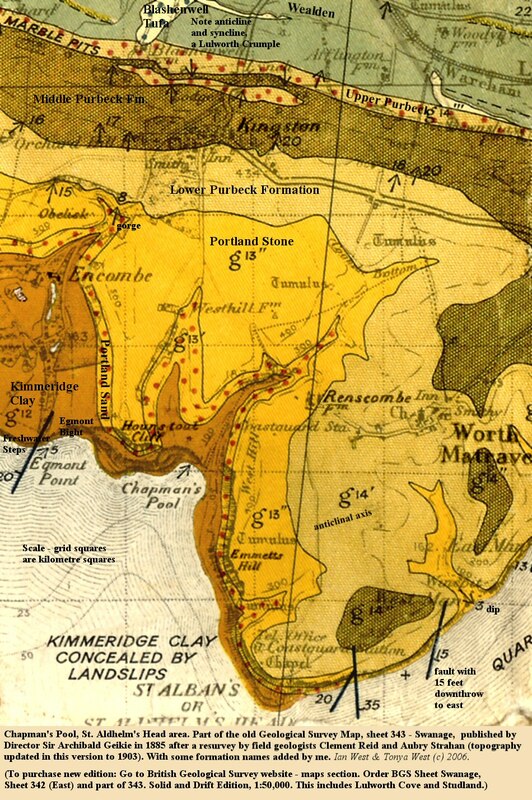 It is interesting to consider whether the Lingula Shales have any similarity in terms of conditions of deposition to the well-know and much older Lingula Flags of the Cambrian System of Pembrokeshire, South Wales. Those old sediments, which actually contain the related Lingulella, are silty and sandy, though. Note that Lingula still exists at the present day. 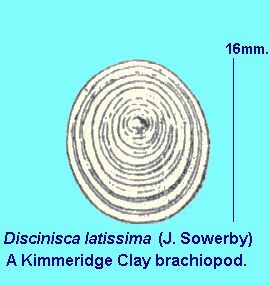 Right: Discinisca latissima, a Kimmeridgian brachiopod of unusual circular shape. To see this look in the Crushed Ammonoid Shales at Chapman's Pool and Egmont Point. Here you will see this with crushed pavlovid ammonites, Lucina minuscula and other fossils (Strahan, 1898). Not shown here is the brachiopod Rhynchonella (Rhynchonella) subvariabilis which occurs in the Upper Kimmeridge, Rhynchonella Marls and adjacent strata of Houns-tout Cliff. The range of its common occurrence here is from the top of Blake's Bed 3 up to the top of Bed 1 (Cope, 1978) . The Crushed Ammonoid Shales, with crushed Pavlovia ammonites, form the lower part of the cliff on the west side of Chapman's Pool. 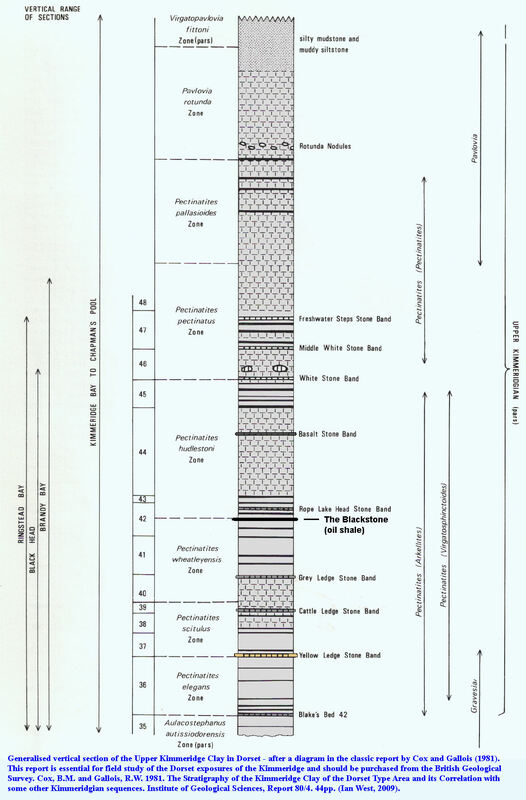 The hard shale top of this unit, Blake Bed 2, is bituminous and is listed as an oil shale (the highest oil shale) according to Cox and Gallois (1981). It forms a slippery platform on which the waves break from the stream at the head of Chapman's Pool to the boathouse. The crushed ammonites can be easily seen. This same hard bed is a good marker horizon and is a useful datum in the cliffs to the west of Chapman's Pool. 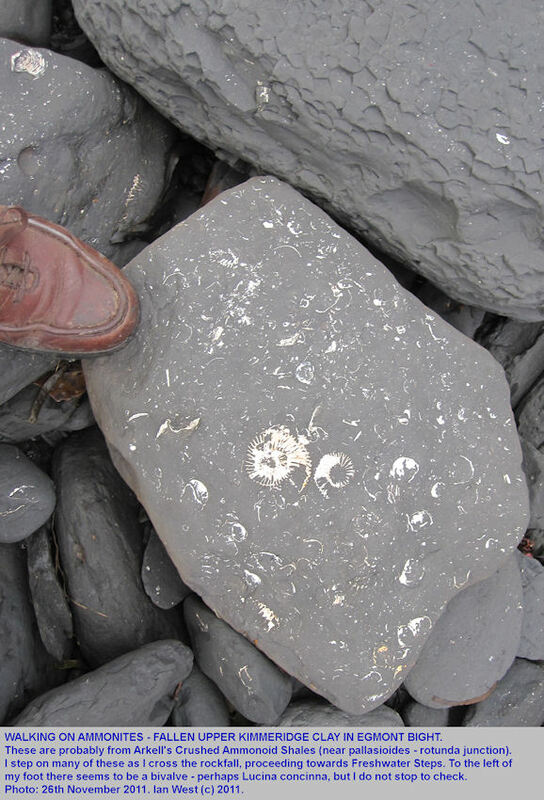 "Chapman's Pool Pebble Bed, a gritty shell-rich pebble bed with phosphatized pavlovid-body-chamber pebbles, abundant Pachyteuthis [cuttle fish], oysters and other bivalves at base: and crushed and partially phosphatized Pavlovia including Pavlovia concinna, P. sp. nov. aff. varicostata Ilovaisky, P. rotunda, P. sp. B of Cope, 1979." 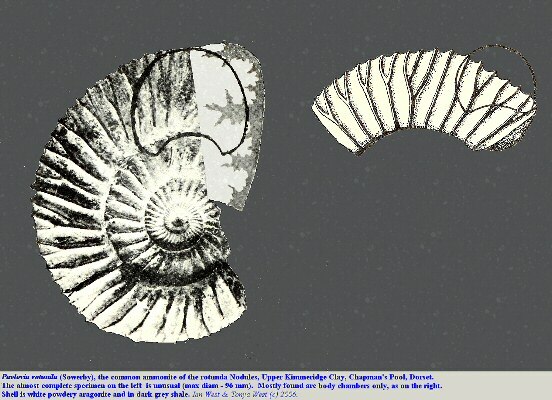 The Crushed Ammonoid Shales are 33.22m thick according to Arkell (1947). Below the top hard shale unit of 1.25m (within the Pavlovia rotunda Zone) these shales belong to the Pavlovia pallasioides Zone and the zone fossil occurs in most of the beds. The full details are not given here, and reference should be made to Cope (1978) for more information. Blake's Bed 2 can be studied in section in the cliff and horizontally in the hard ledge in the centre of Chapman's Pool. Most ammonites can be seen to have sunk to the sea floor so as to lie in a horizontal attitude. However, a small proportion (perhaps about 1 in 50) have descended with the plane of spiral in a vertical orientation. Thus the Upper Kimmeridge Clay here contains a number of spiral tubes in vertical orientation which have been subjected to severe vertical compaction. This has happened during the change of this potential oil source rock from a plastic clay like the Barton Clay (local Eocene) to the hard shale of the Kimmeridge Clay. No serious study is made here, but, as a possible future research project, they could be investigated in detail by a structural geologist. Perhaps they could be modelled by artificially compressing nautilus shells in laminated mud. As shown in a photograph, when a vertically orientated spiral tube of aragonite (an ammonite) in mud is severely compacted it can fail in an interesting manner. There can be a telescopic compaction of a broken but narrower part of a whorl into a wider part of the whorl. This is best seen in a body chamber, which, of course, was mud-filled, unlike the inner chambers which merely contained water. Incidently notice the infaunal, burrowing bivalves. 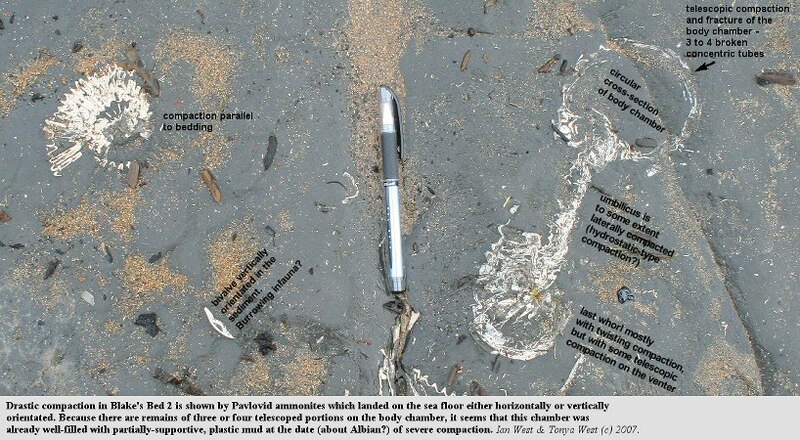 The sea floor was not anoxic, even though this is a bituminous shale (but not as kerogen-rich as the Blackstone). There is an interesting succession of the uppermost Portland Sand exposed at the top of Houns-tout Cliff. Unfortunately, it is not easily accessible and it is not recommended that you approach the cliff edge. Not only is it high and exposed but the top rocks of this hill are relatively unstable and lumps fall away to the mid-slopes from time to time. Remain on the coast path and do not try to descend over the edge. I have provided some photographs to give the general view of the top dolomites etc. For studying the detail you can examine fallen blocks on the shore at Egmont Rocks in relative safety. 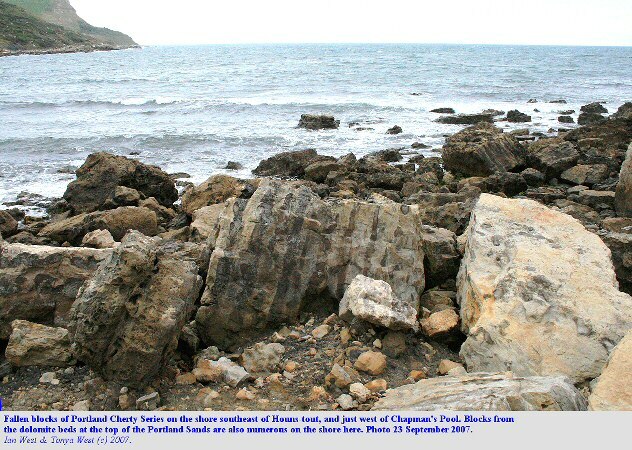 Above the uppermost Portland dolomite there is residual chert from the base of the Portland Cherty Series. Some small lumps of this chert are entirely of serpulite. These, too, are not easily accessed and again the cliff edge should not be approached. 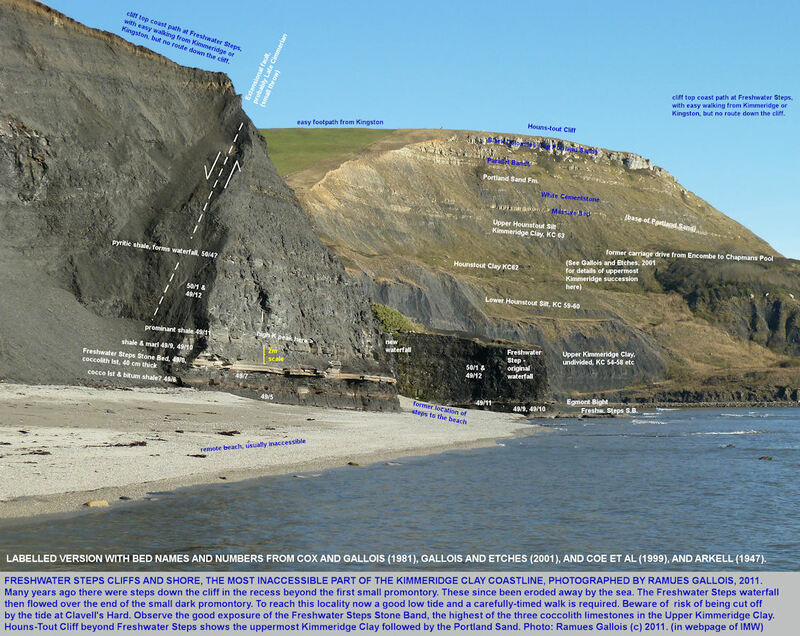 The large rocks on the shore around the foot of Houns-tout Cliff have probably been transported seaward mainly by former mudslides. 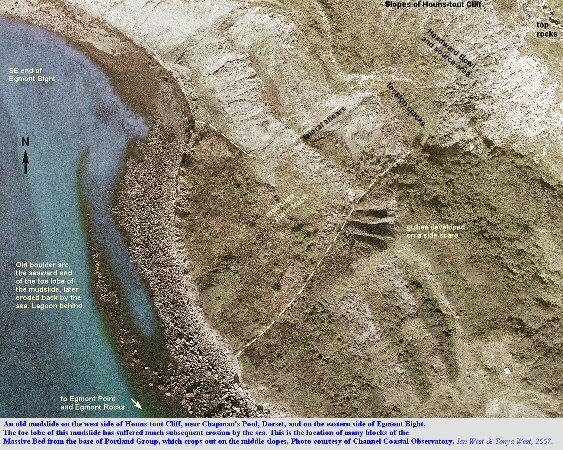 There are no indications here of large rotational landslides as are well-developed on the west cliffs of the Isle of Portland. Topples may have occurred on a limited scale but there seems little evidence of large topples. Transport of blocks by mudslides to form a boulder arcs on the shore can be seen on both the east and west sides of Houns-tout. 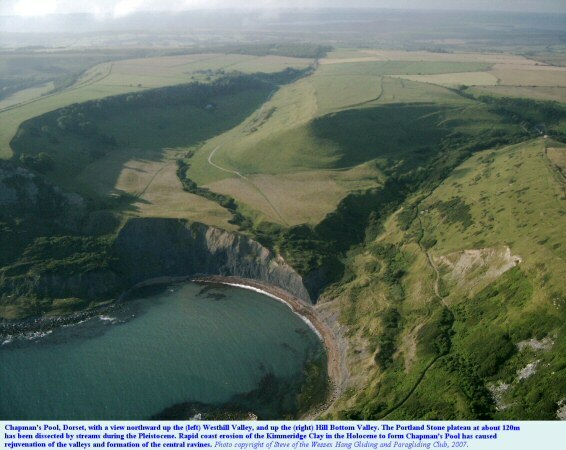 Examples are shown in the aerial photographs above, which are courtesy of the The Channel Coastal Observatory , National Oceanography Centre, Southampton. 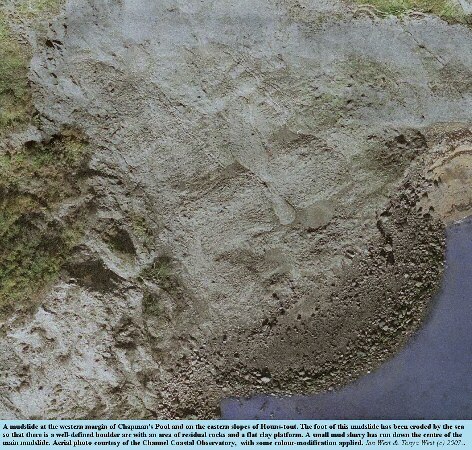 The blocks of the Massive Bed on the shore have been transported down in the old mudslide on the western side of Houns-tout (and shown in the lower aerial photograph above). It is suprising to see large blocks of relatively fresh Portland Cherty Series on the shore both at Egmont Point (south-southwest of Houns-tout summit) and at the eastern rocky promontory (southeast of Houns-tout summit). 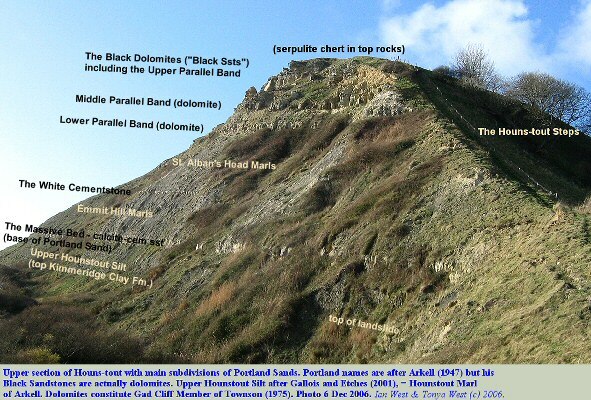 The present top of Houns-tout is mostly of the Parallel Bands (Portland Sands dolomite) and the Black Dolomites (formerly called the "Black Sandstones" but consisting of dolomite - see Townson, 1975 for details). The dolomite also occurs as fallen blocks on the shore, as would be expected. 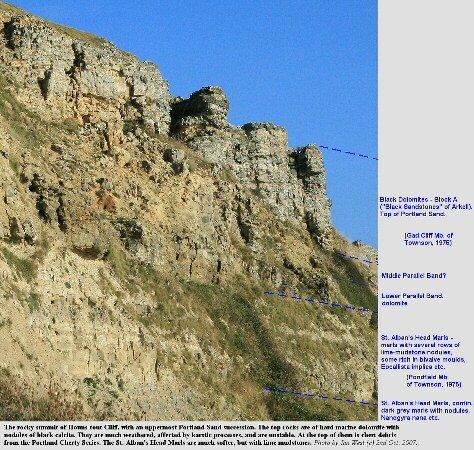 The base of the Cherty Series is present on the hill (see the BGS Swanage map) but is very thin at the cliff edge and represented by weathered residual debris such as serpulitic chert. These large blocks of Cherty Series suggest that in the recent past there was a greater outcrop of Cherty Series at the former southeast extension of Houns-tout. Perhaps there was a rather higher summit of these upper strata. At one stage in the past, of course, Houns-tout was not a cliff but a south-projecting hill very similar to nearby Swyre Head (Encombe is at the site of a future new "Chapman's Pool" when sea-level rises and the coast retreats). Numerous blocks of Portland dolomite are present amongst the fallen rocks of Egmont Rocks and adjacent area. The dolomite is from the Parallel Bands and the Black Dolomites. It often contains unusual black calcite with curved crystal faces and the poikilotopic inclusion of quarts sand grains. 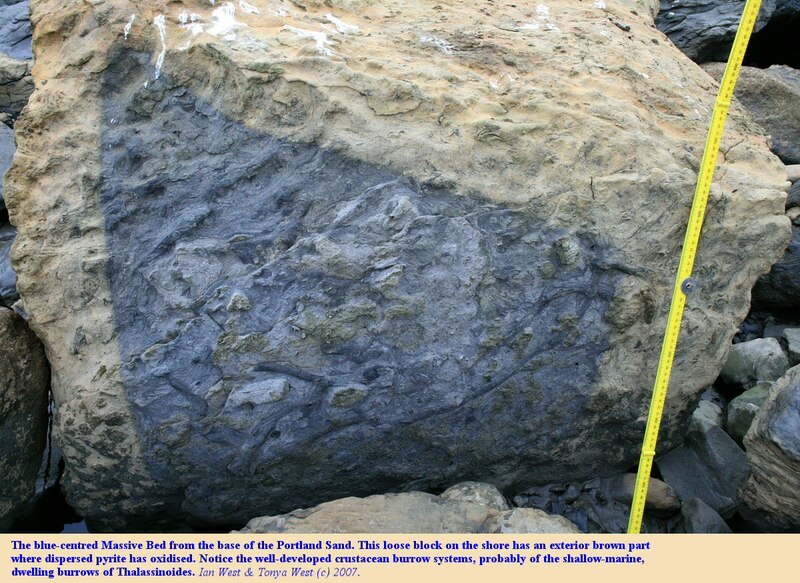 See Portland Sequence for details of the Massive Bed rocks on the shore southeast of Egmont Bight. Egmont Bight in an interesting bay to the west of Houns-tout. In favourable tide conditions you can walk round the rocky and muddy shore from Chapman's Pool. It is also possible to descend from the coastal footpath and lower slopes of the western side of Houns-tout, provided this route is not blocked by landslide activity. Egmont Bight is a shallow embayment with good cliff exposures of Kimmeridge Clay (I just wonder whether it might be the "Boteridge Pool" of the old map shown above, although that might have been an early name for Rope Lake Hole). The bay exposes good sections of Upper Kimmeridge shale and mudstone, with some bituminous shale and some small calcareous nodules. The shales belong to the Pavlovia pallasioides Zone (above) and the Pectinatites pectinatus Zone (below). On occasions debris falls from fairly high in the cliff. In 2011 there was a substantial cliff fall in the eastern part of the bay. 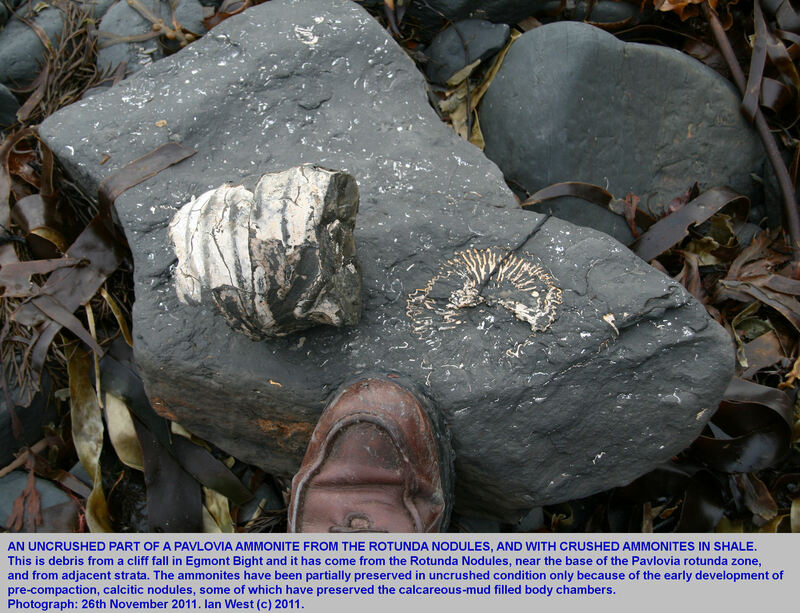 A photograph above shows ammonite material, at least partially from the Pavlovia rotunda Zone. The waterfall at Freshwater Steps used to drop over the end of the promontory, but the water now slips down close to the former position of the steps (now eroded away). The original lip was on over hard shale of Blake's Bed 8 of the Pectinatites pectinatus Zone. This is probably bed KC 50/4 of Coe et al. (1999). The Freshwater Steps Stone Band is a coccolith limestone also within this zone and forming the sea-level base of the headland. The dip continues with a gentle easterly dip. 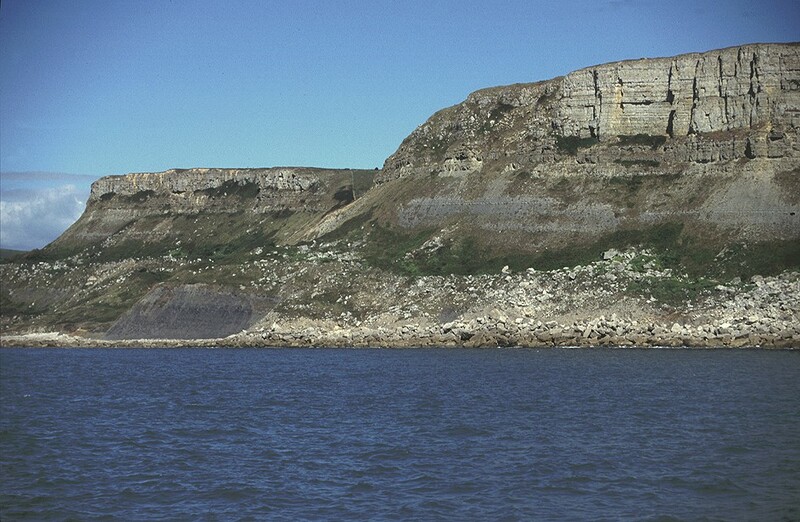 Thus the western part of the foot of the cliffs of Egmont Bight is in the Pectinatites pectinatus Zone. 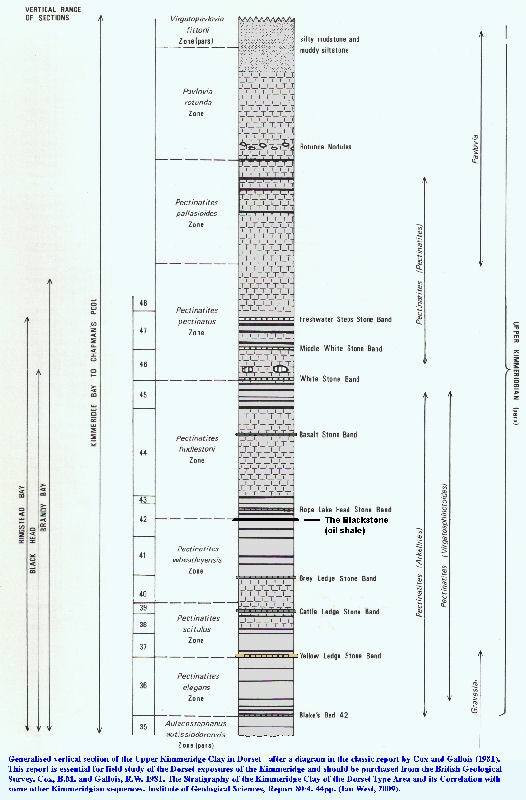 Particularly useful for details from the Rotunda Nodules downward is the graphic log in Cox and Gallois (1981). It is the log entitled Freshwater Steps to Chapman's Pool. 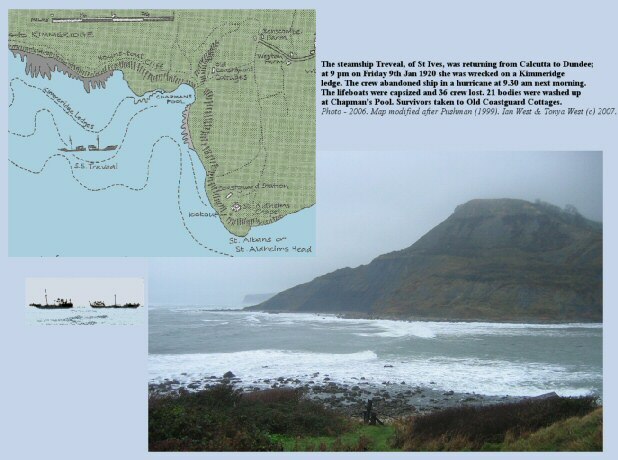 On the 11th July, 1866 the French barque Georgina of four hundred tons was driven ashore at Chapman's Pool, but her crew of thirteen and two passengers were saved by a rocket line fired to the ship by the coastguards. Her cargo of coffee, cocoa and mahogany was largely unloaded when the weather was calm. The ship was destroyed. The steamship Treveal, of the Hain Steamship Company of St. Ives, was wrecked in 1920 in eight fathoms, a mile offshore of the rocks of Egmont Point. The 5,200 ton ship was carrying jute and manganese from Calcutta to Dundee. For reasons that are not clear and have been disputed, members of the crew were either not attentive enough or not accurate enough to set a correct course from Portland so as to clear St. Aldhelm's Head. As the ship passed Weymouth a Lloyd's officer placed a bet that the ship was on a course that would take her aground. 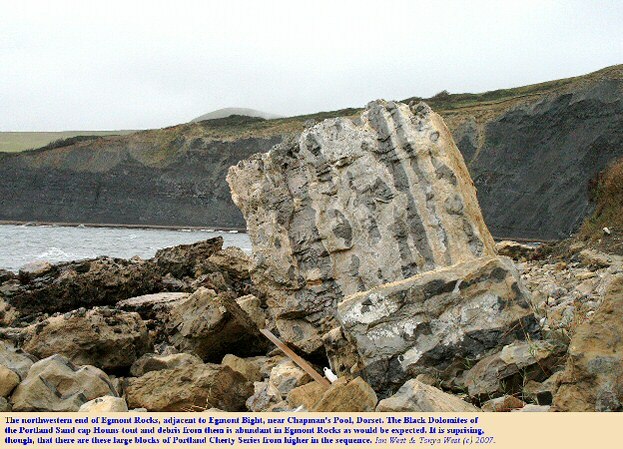 The ship struck a Kimmeridge ledge at 9pm on the evening of Friday 9th January, 1920. The weather was calm and clear and there was no great danger at that time. A tug was sent for but it did depart until midnight and, as the weather deteriorated into rain and choppy seas developed, it did not find the ship. The tug went out again at 5.30am and found the ship but by now there was a gale and sleet and the tug could not approach. At 9.30 am the captain decided, probably unwisely, to abandon the ship. It had broken in two off Houns-tout Cliff but was fixed firmly on the rocks and could not sink further. If the crew had stayed they would probably have survived. A straight inshore landing had been advised by coastguards, but the weather had been better then. The gale had increased to something like a hurricane and the waves were breaking over the cliff. The air was full of was driving sleet. As the lifeboats tried to land by approaching the rocks and shale of Chapman's Pool they swung broadside to the breaking waves. They were overturned in the crashing storm waves and the crew were thrown into the water. Thirty-six of the crew died from injuries produced by the pounding of the waves on the rocks and from inability to get out of the cold and violent water. The coastguard of nearby St. Aldhelm's Head did not respond. No coastguard came to see, let alone help, although they had known about the wreck from the previous day. A local clergyman, the Rev. Horace Piercy, and a fisherman got down on the shore of the pool and struggled in fierce cold waves to pull some of the seven survivors ashore. There were many dead, some gashed and half-naked, on the beach of Chapman's Pool. It was strewn with wreckage (see Daily Mirror, Wednesday, Jan. 14th 1920 - "The wrecked steamer Treveal, broken in two lying on the rocks in Dead Men's Pool"). Helpers came and the bodies of twenty crew were hauled up the shale cliffs on planks. They were then taken by horse and waggon, heaped up three deep in the cart, up the wooded valley to the reading room at Worth Matravers. The ship remained on the rocks for some time; much of the cargo of jute was recovered; the chief officer of the coastguard was court martialed and lost his post. For more information and pictures see Legg (1984, Guide to Purbeck Coast and Shipwreck) and Pushman (1999, The Loss of the SS Treveal: Dorset Shipwreck Mystery). OFFICERS - Charles Paynter, captain, Edwin H Hutchinson, Charles C Tait, William J Donald. SAILORS - James E Bassett, William Bryant, A Kewn, Thomas Noall, Henry Pearce, W Richards, Arthur W Winterbottom. APPRENTICES - Frederick H Argall, Harold E Chumbley, Kenneth Kirby, Douglas 0 Nidd. COOKS etc - Allan Woolcock, William U Phillips, Thomas R Curnow, W A Symons, Garfield Andrews. WIRELESS OPERATORS - Shaw, Joseph Kavanagh. ENGINEERS - Robert H W Thirkell, William B Whyte, Harold Dobinson, W R Griffiths. OTHERS - 'a Tynesider', name unknown; H Currie; S Devlin; Martin Donlon; Patrick Foley; Gallagher; C Gallon; Peter Hendry; John Hosie; McCotch or McCotneh; John McCallum; McVeagh or McVeigh; Regan or Regas; J Rodden; Peter Rooney. 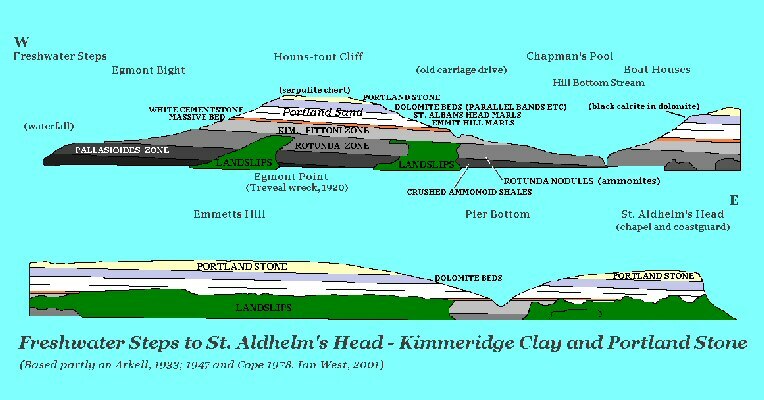 Go east to St. Aldhelm's Head (St. Alban's Head)? I am very grateful to Dr Clive Boulter for the use of photographs taken from the paddle steamer Waverley in 1997. There is much reliance here on the valuable work of Ramues Gallois and Steve Etches. I very much appreciate permission to use the excellent aerial photographs of the The Channel Coastal Observatory , National Oceanography Centre, Southampton. Copyright © 2018 Ian West, Tonya Loades and Joanna Bentley. All rights reserved. This is a purely academic website and images and text may not be copied for publication or for use on other webpages or for any commercial activity. A reasonable number of images and some text may be used for non-commercial academic purposes, including field trip handouts, lectures, student projects, dissertations, examinations etc. providing source is acknowledged and no other copyright is taken.